85 roller coasters in two weeks. Really, does life get any better than that? 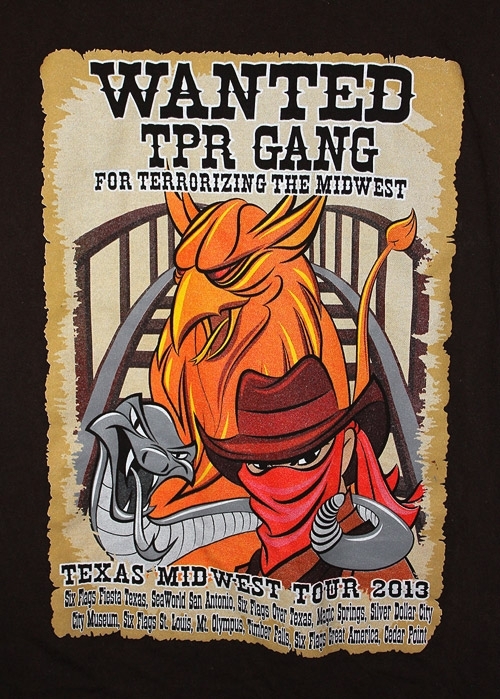 Welcome to my trip report for the 2013 TPR Texas/Midwest tour. This may take me a few months to complete, but an epic trip like this one deserves that kind of effort! I originally registered for the TPR forums in February of 2006. 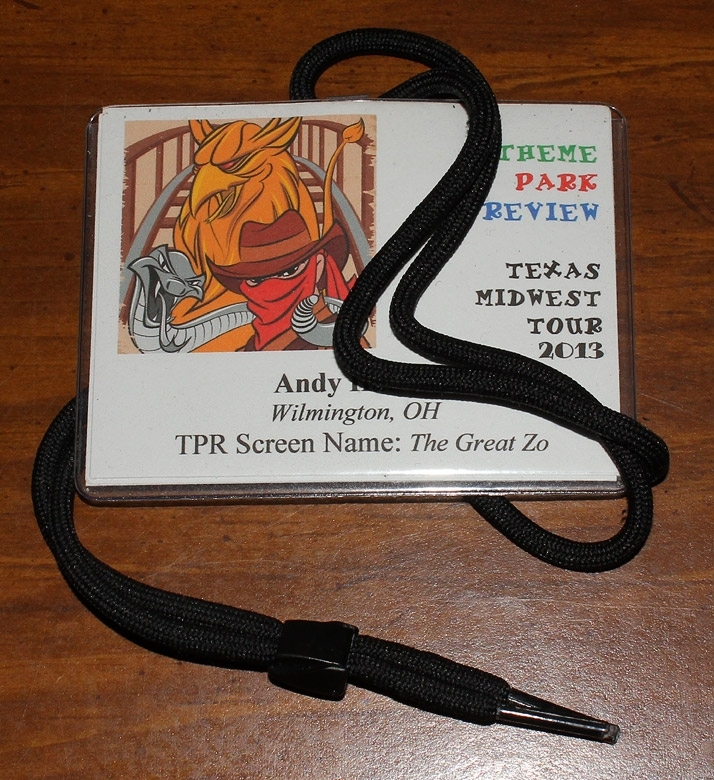 I didn't make my first post on TPR until November 2012, but I kept up with the emails and followed along with all the tours. They looked like an absolute blast, and something I wanted to try. It was just a matter of finding an empty spot in my vacation schedule, and convincing myself that a week or two with a bunch of people I'd never met before would be something I could handle. 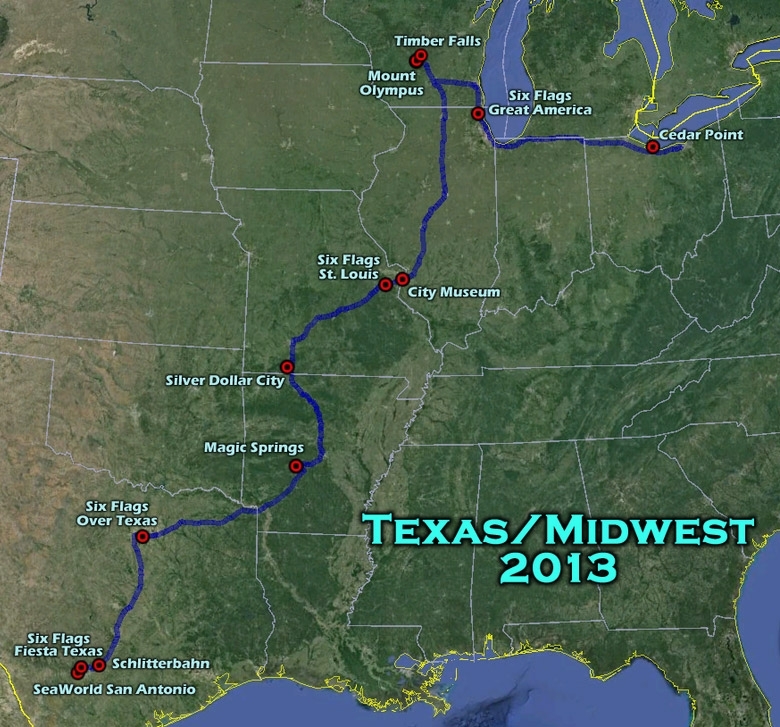 It was early in the morning of November 28, 2012, when an email from Robb came in to advertise the Texas/Midwest trip. Somehow, in the haze of having just gotten home from my sixth midnight shift in a row, it finally clicked -- this is it! I registered about a month later, and the rest is history. 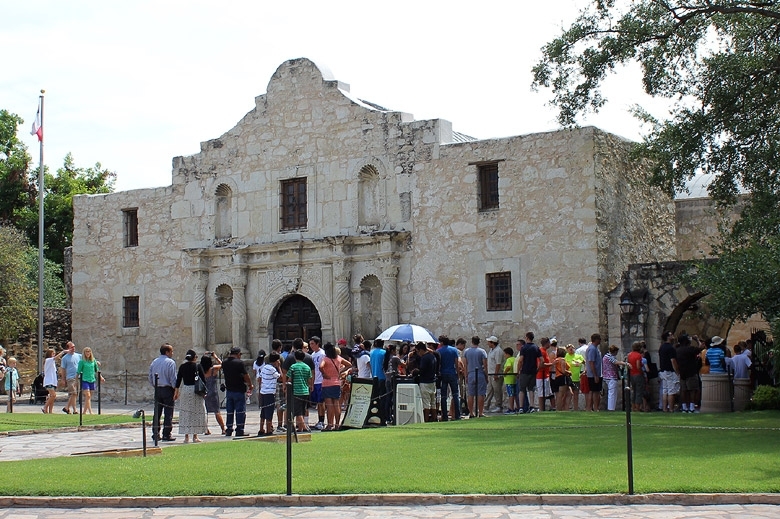 That history has already been shared in a few other trip reports -- TPR has some very skilled photographers and writers, and I can only hope to supplement some of the fantastic images and stories that have already been told. 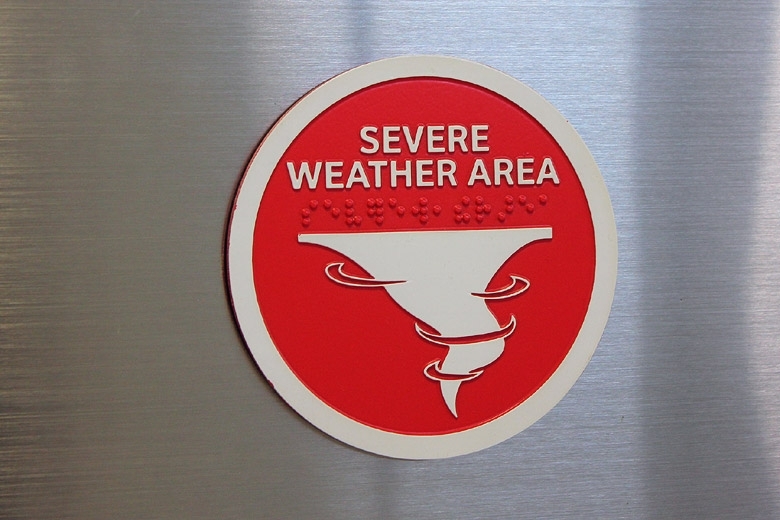 I'm going to do a couple extra things with this report -- sharing one lesson learned for each day, perhaps as guidance for future trip participants, or just as a humorous recollection of things I wished I'd done differently. I'll also share some of the artifacts I brought home from the trip -- keepsakes from a fantastic two weeks, and relics of the generosity of our various amusement park hosts. The Texas/Midwest trip gave me several important coaster milestones (and combined with a visit to Busch Gardens Williamsburg and Kings Dominion earlier in the year, 2013 doubled my coaster count and then some). Of the 85 coasters on the trip, all but 14 at Cedar Point were new to me. 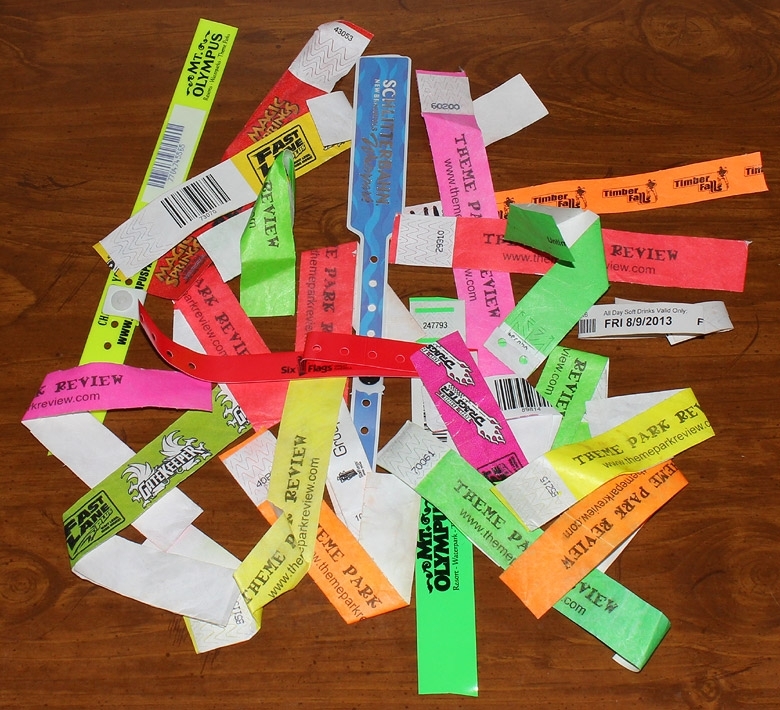 In all, I had a total of 176 roller coaster rides, with 288 inversions. 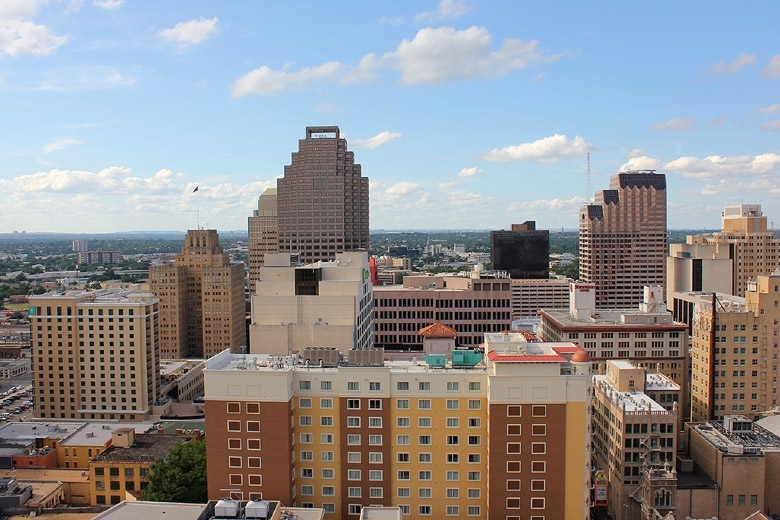 But enough of the math -- it's time to head to San Antonio! A note for those of you who were on the trip: I have a ton of pictures of TPR members and TPR-specific events from the trip, which I posted a link to in the trip forum. 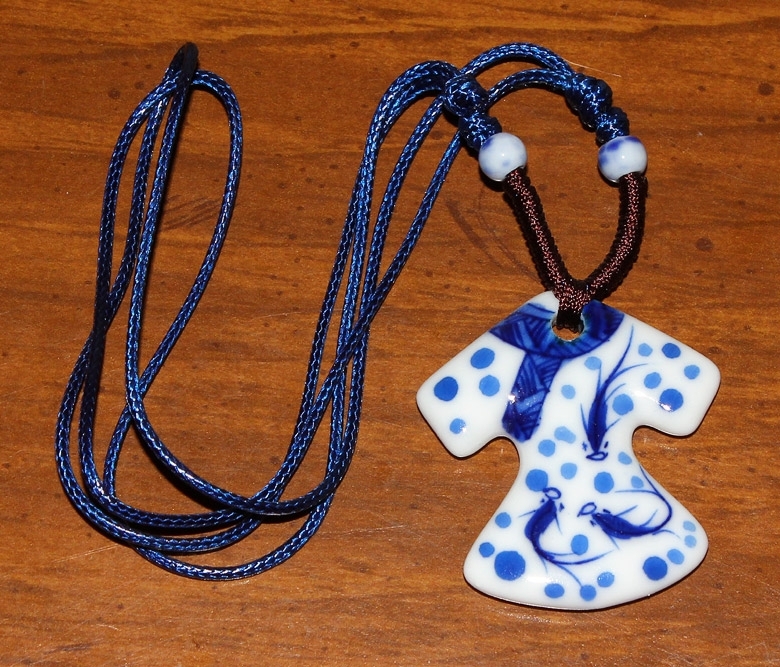 Those are being made available just to the participants. Give them a look if you're interested. Last edited by The Great Zo on Sat Jul 19, 2014 10:28 pm. Lesson of the Day: Don't try to rent a car without a scheduled return flight or a credit card. You can't do it. A debit card isn't good enough, and you probably don't carry enough cash to cover the deposit (unless you're crazy). So, my first-ever attempt to rent a car was unsuccessful, because I'd never learned this simple rule. 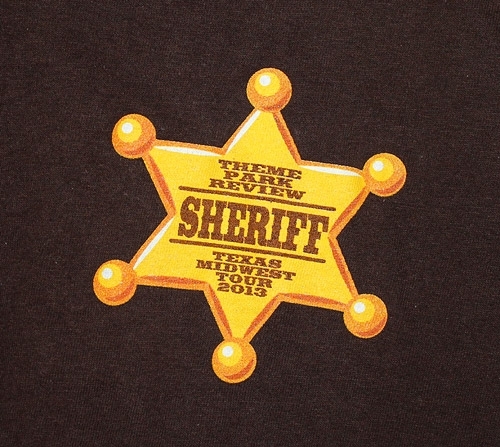 I was very fortunate to have TPR members there to bail me out and get me where I needed to be! 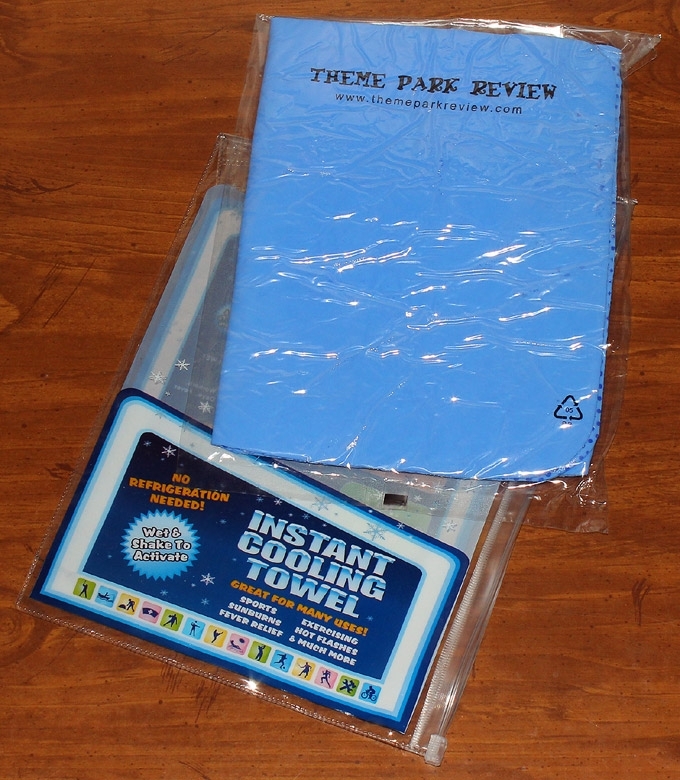 Nothing yet from the parks, obviously, so I'll share a few general items I picked up along the way -- many of them courtesy of TPR. Every trip participant got their very own lanyard/nametag. With over 90 people on the trip, most of us kept these on until the last day -- it really helped with learning names and hometowns! We received a pack with numerous TPR items, including this towel, which I really should have used during those blistering hot days in Texas. I won't make that mistake again! Among other items not pictured: TPR backpack, luggage tags, luggage handle, and plenty more. 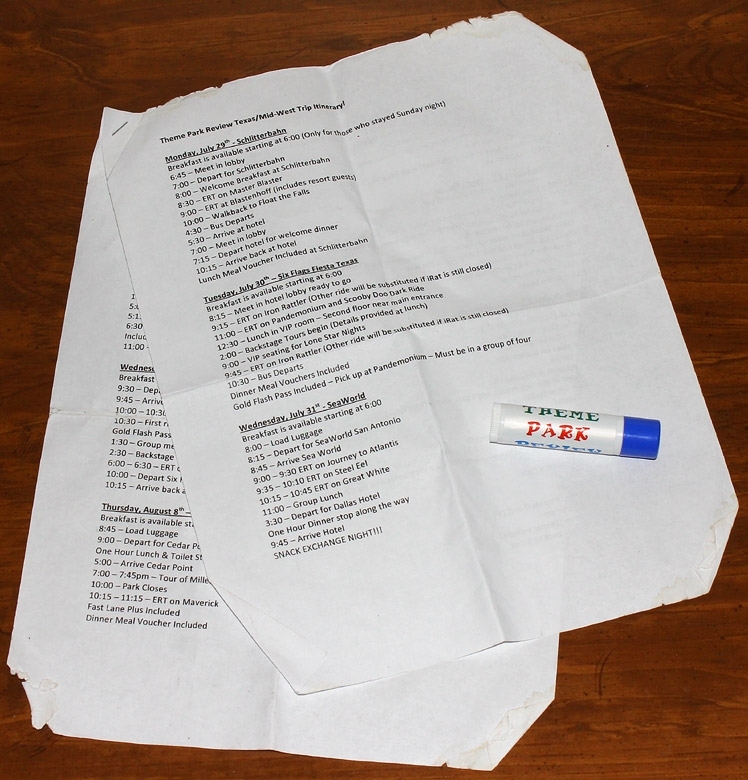 Seen here is a well-worn copy of the trip itinerary, fully detailing all of our adventures and arrival/departure times. Also pictured: the official TPR lip balm. 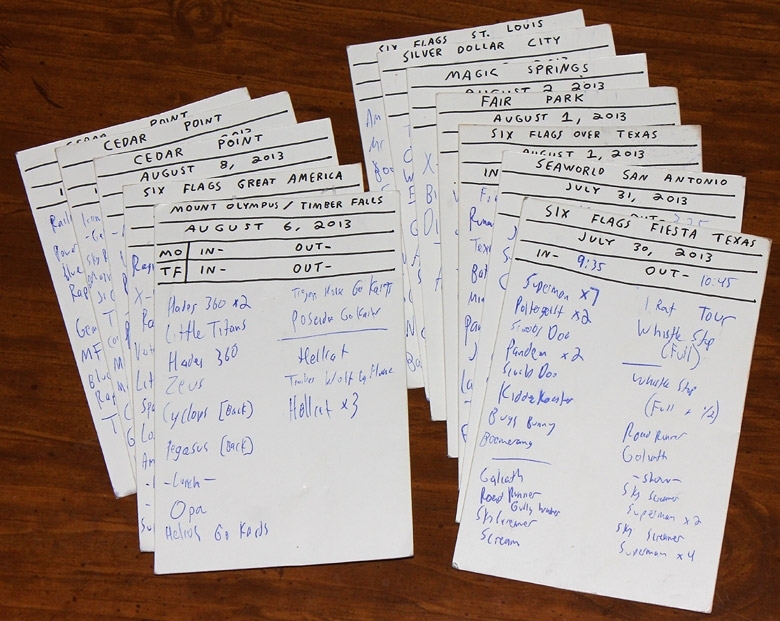 I'm a stickler for details, and kept scorecards to list out every ride at every park we visited. The complete set, in mint condition, is priceless! Finally, I have to share a special gift from Yin (gerstlaueringvar) -- this is just awesome, and I have it hanging on my wall now! I'd love to learn more about it, Yin, if you can share! 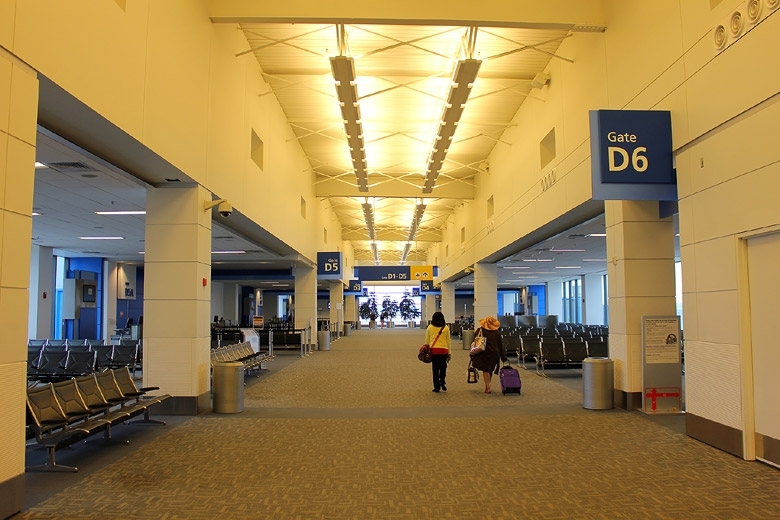 Day -2 (Saturday, July 27) started at the Detroit Metropolitan Airport (DTW) North Terminal, headed south to Dallas / Fort Worth (DFW) for a connecting flight to San Antonio (SAT). 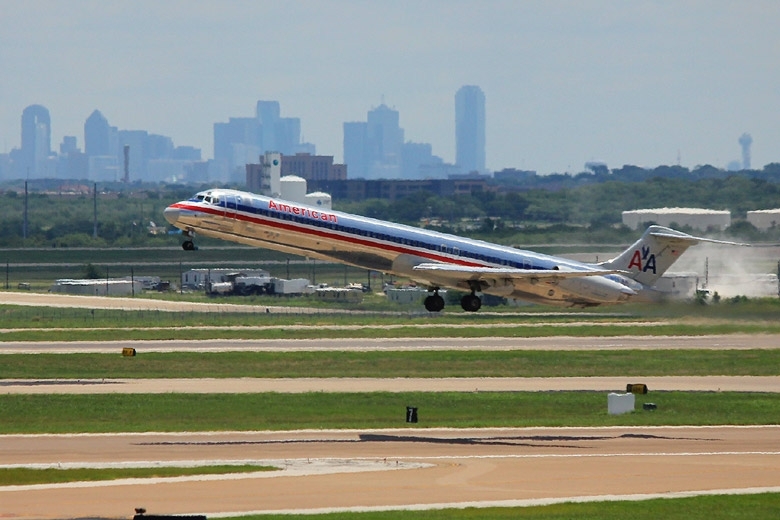 My flight from DFW to SAT was delayed by about an hour, but the aforementioned rental car issue was the biggest change in plans for my day. I headed back to the airport, meeting up with Neil, James, and Stacy G -- who graciously (thanks Stacy!) 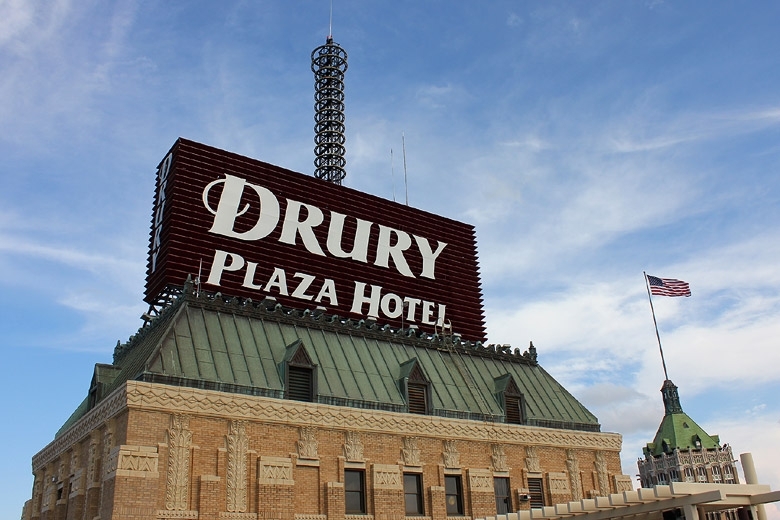 brought me downtown to my hotel, the Drury Plaza. 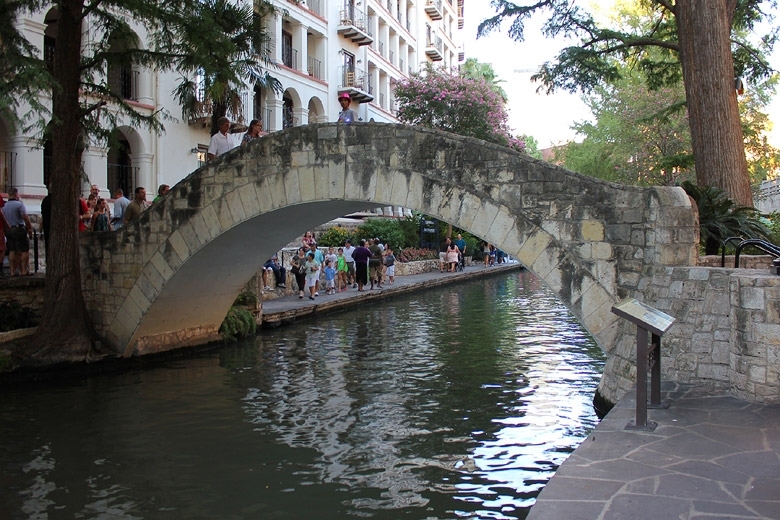 We met up later in the evening to explore San Antonio's famous Riverwalk, and then again the next day (Day -1, Sunday the 28th) to see the Alamo and the Tower of the Americas. Along the way, it was great to meet several other trip participants -- Doug M, Doug H, Dan, Victor, Stacy H, Thad, and probably several others! Thanks to all of you for making my pre-trip days a breeze and a lot of fun. 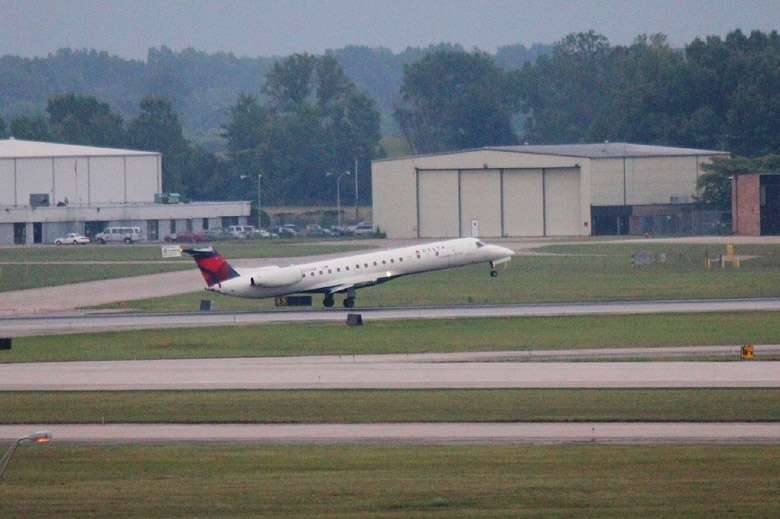 A dreary day at DTW. 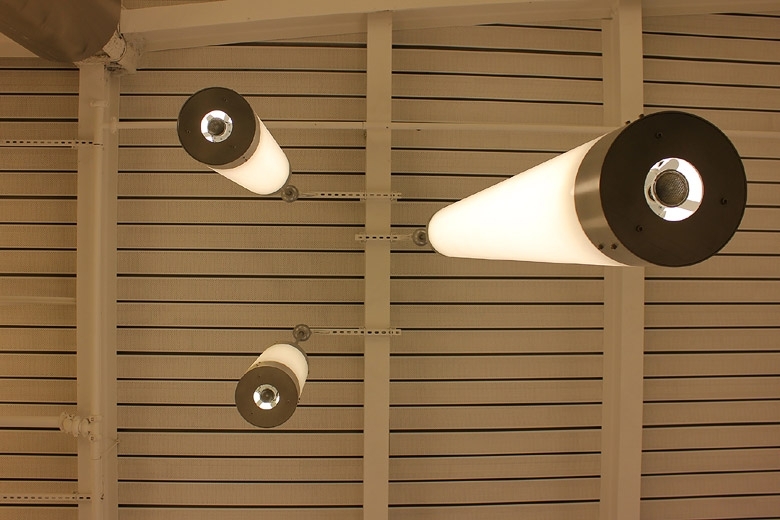 Cool lighting in the terminal! The journey is just getting started. 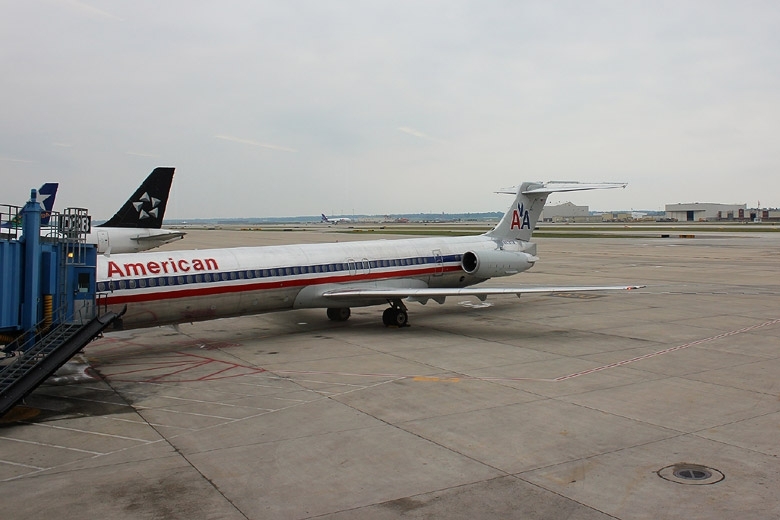 My ride to Dallas is here. No problems on the first leg of the trip -- several nice photo ops out the window. 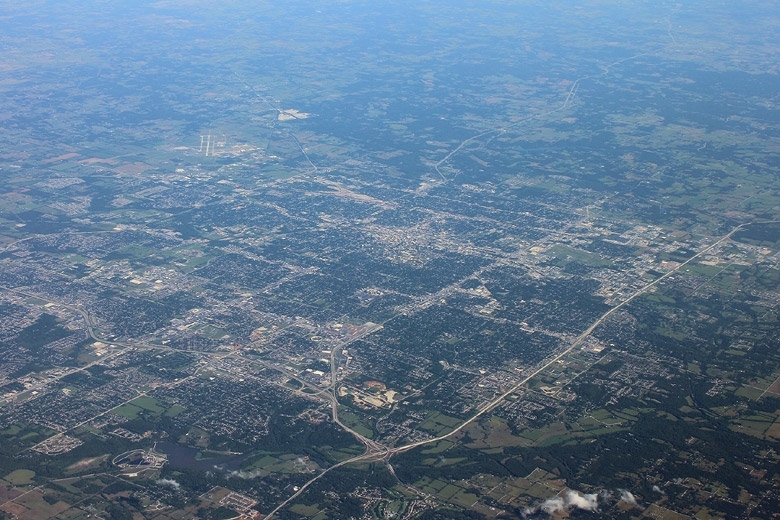 Flying over Springfield, Missouri. 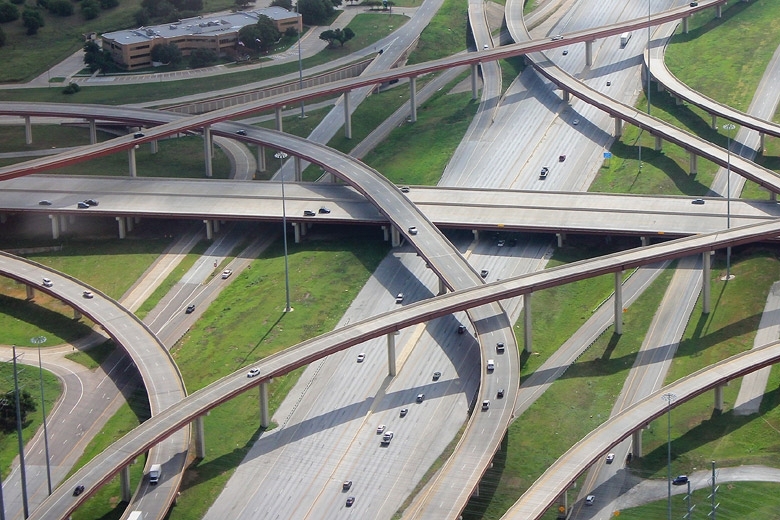 We'd travel that highway on the right (east) side of the city just about a week and a half later. 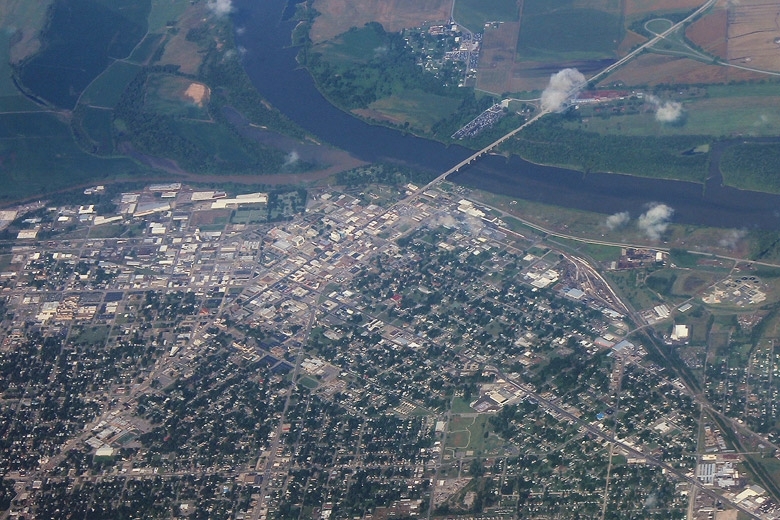 A nice view of Fort Smith on the Arkansas River. 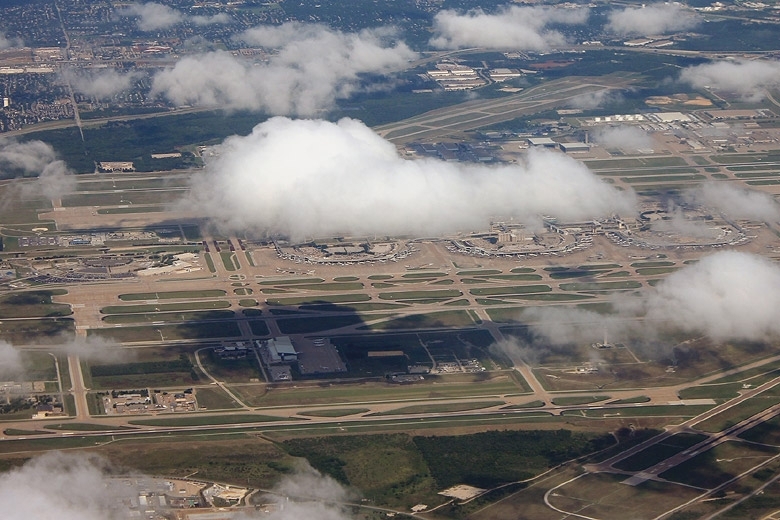 DFW airport with a cloud-hat. 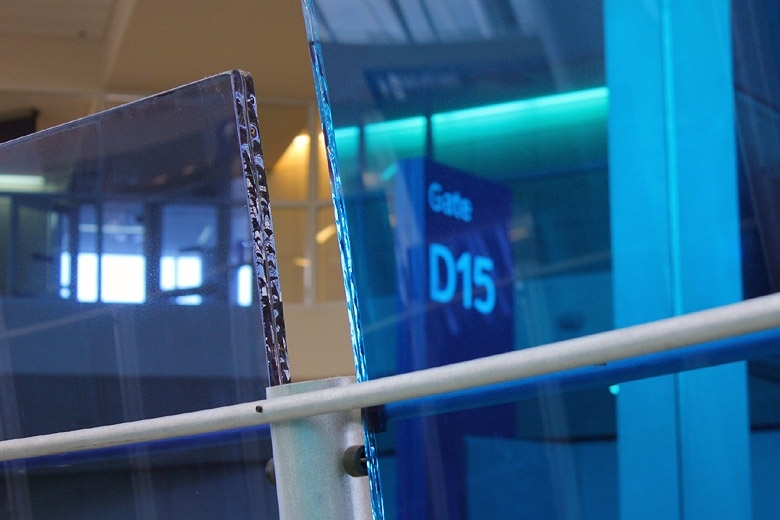 Arrival in the Dallas / Fort Worth airport, and near-immediate news of a flight delay. No idea why, either. Don't know where he's going, but I hope they have cinnamon bread. 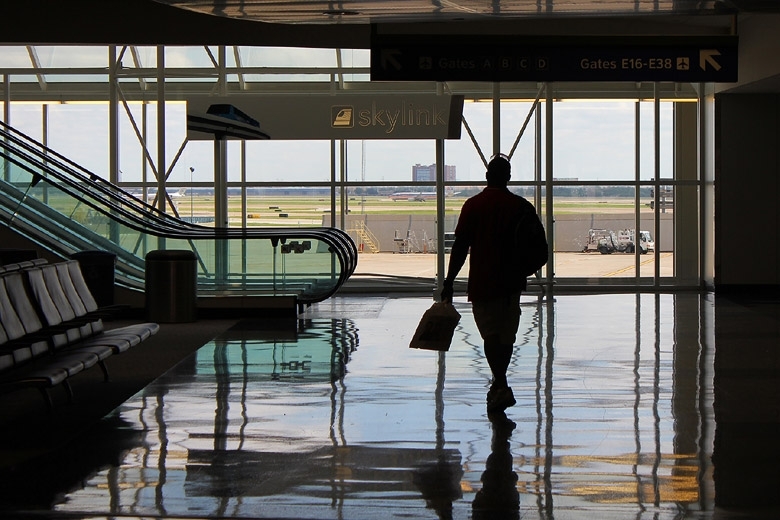 So, it was time to pass the time at DFW with photography. 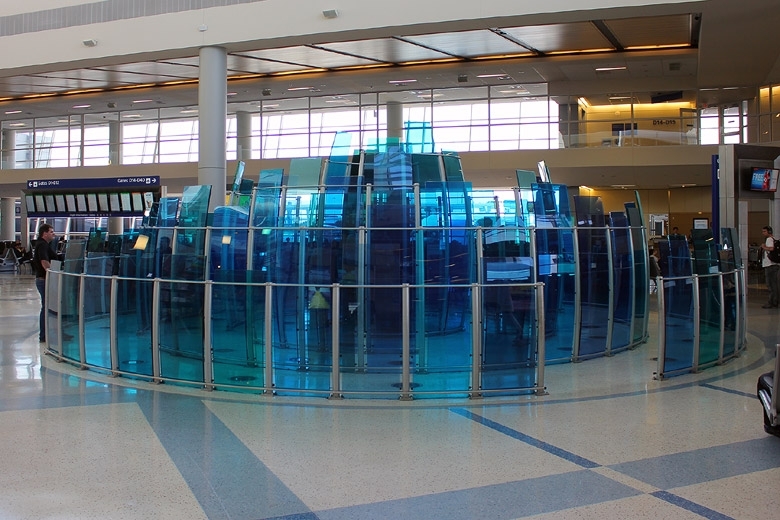 Airport art is ... interesting. 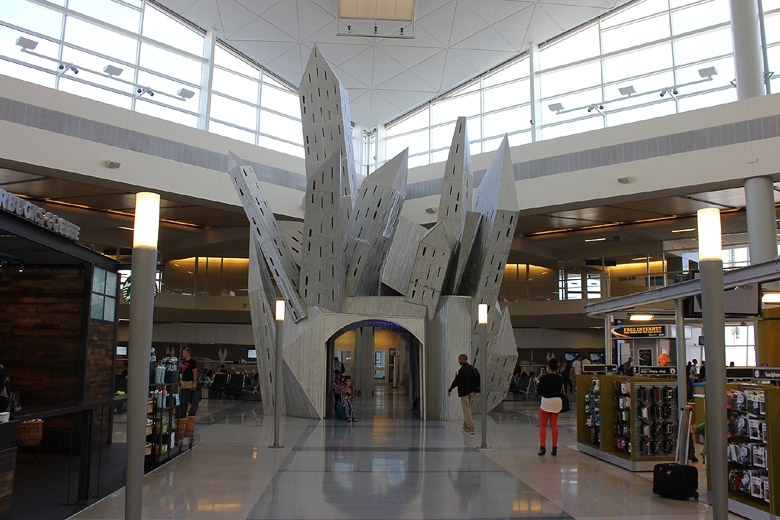 Every airport needs a castle! 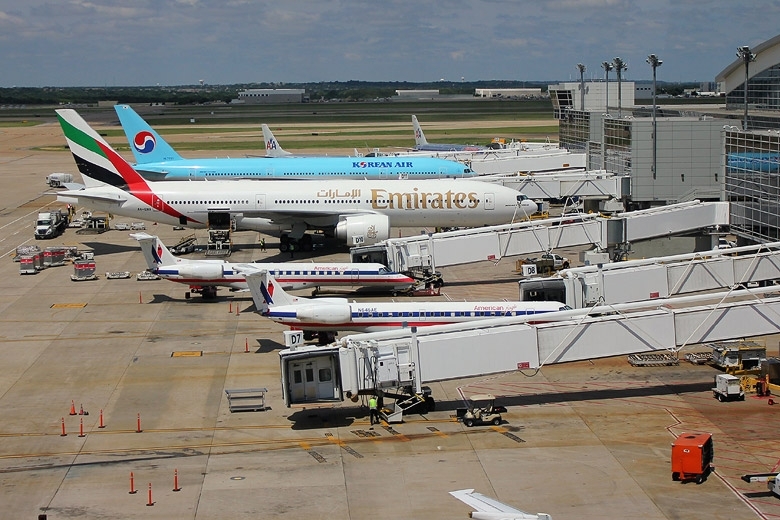 A good idea for an airport in northern Texas. What's that in the distance? 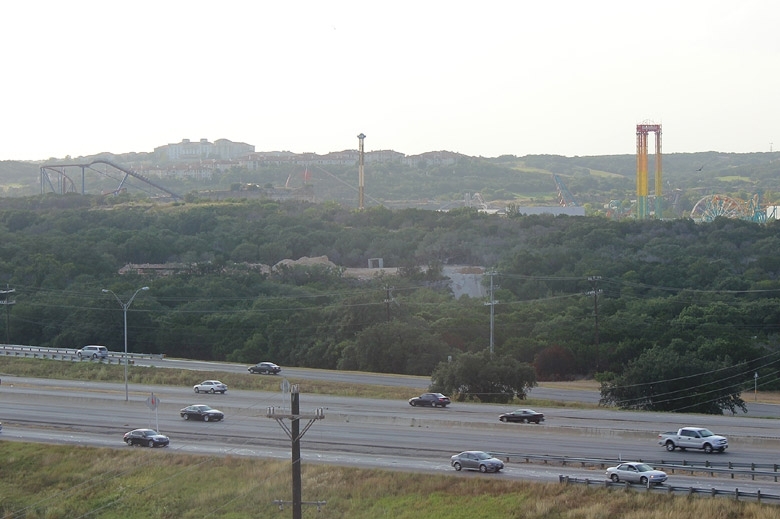 It looks to me like /foreshadowing!/ Six Flags Over Texas -- and our hotel is even visible on the left. 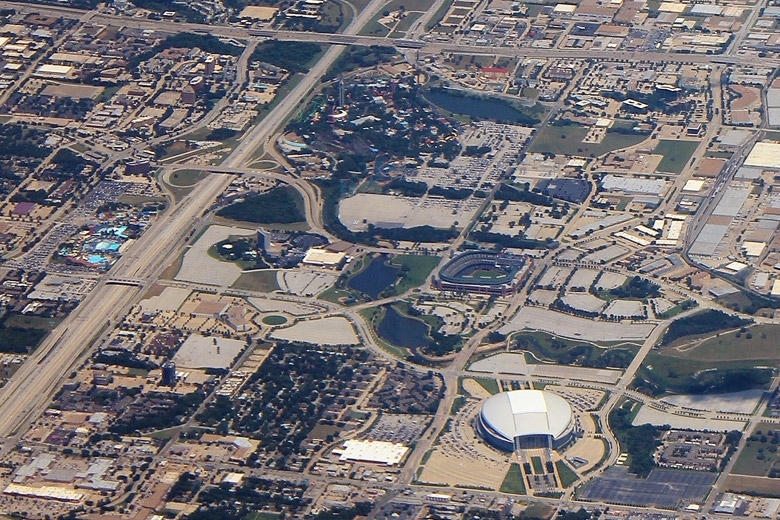 ...passing over Arlington, with another view of a park I'd be visiting in less than a week. Finally, arrival in San Antonio. 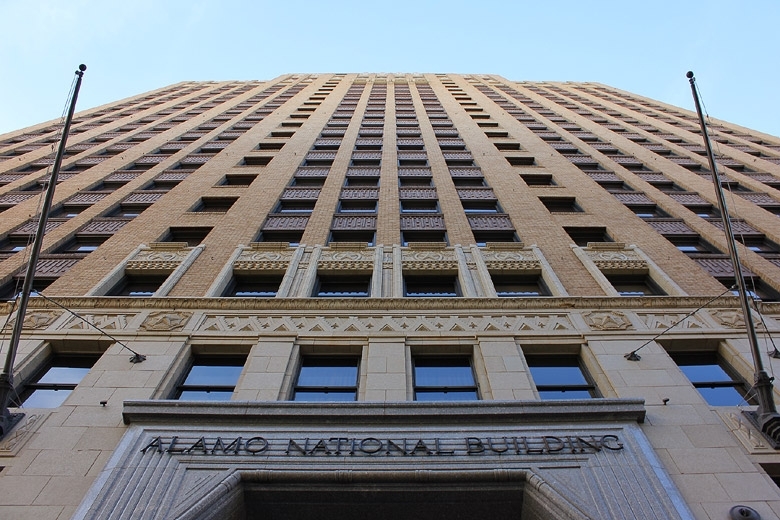 I stayed downtown on the 21st floor of a hotel made out of a 1929 Art Deco skyscraper -- hard to beat that. 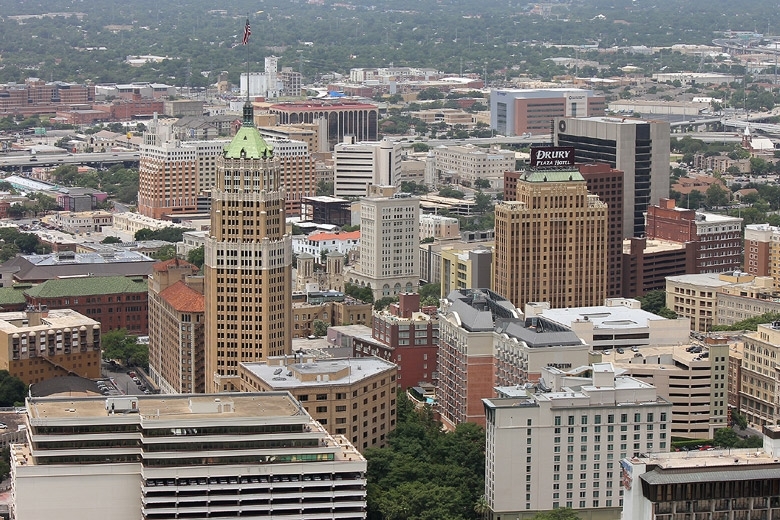 Nice view of San Antonio (too far to see the parks, though). What /is/ that big red thing, anyway? 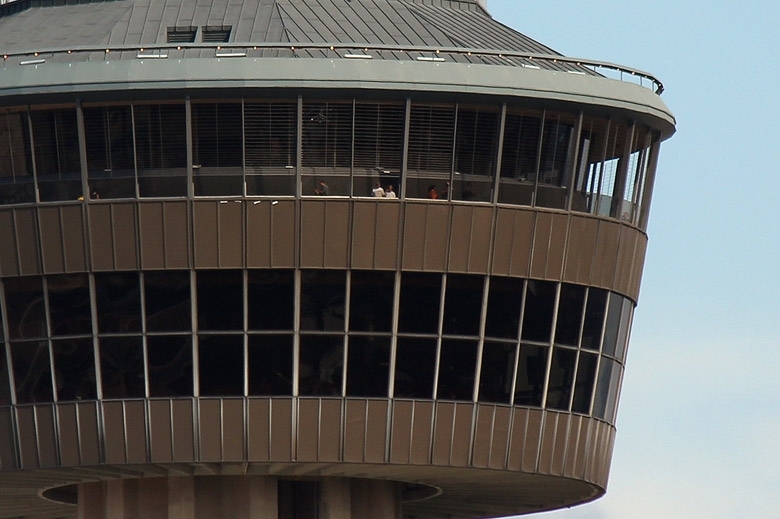 Tower of the Americas, one of several observation decks on the trip (officially or unofficially). 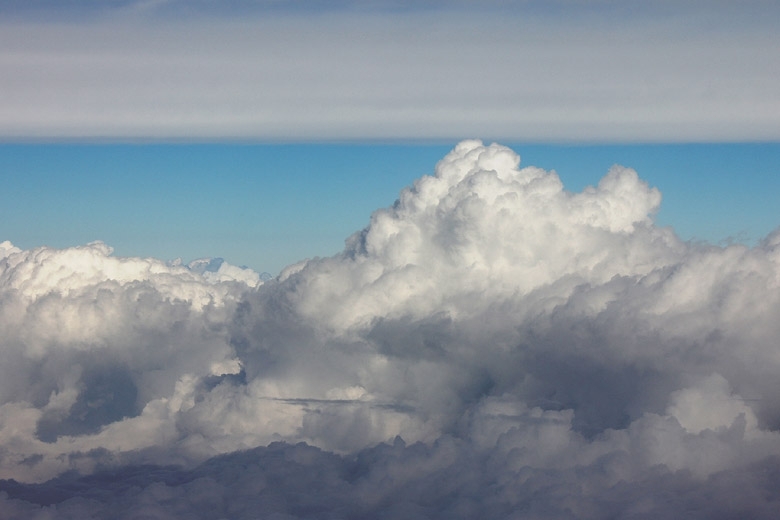 The weather nerd in me likes this shot. 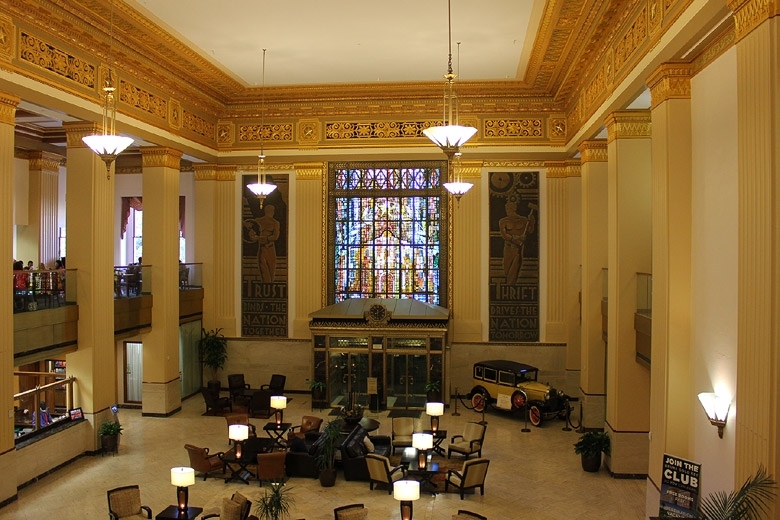 The lobby of the hotel, which was actually the first Drury I'd ever stayed in. Not the last, as they are a favorite of TPR trips, and as I'd learn, for very good reason. 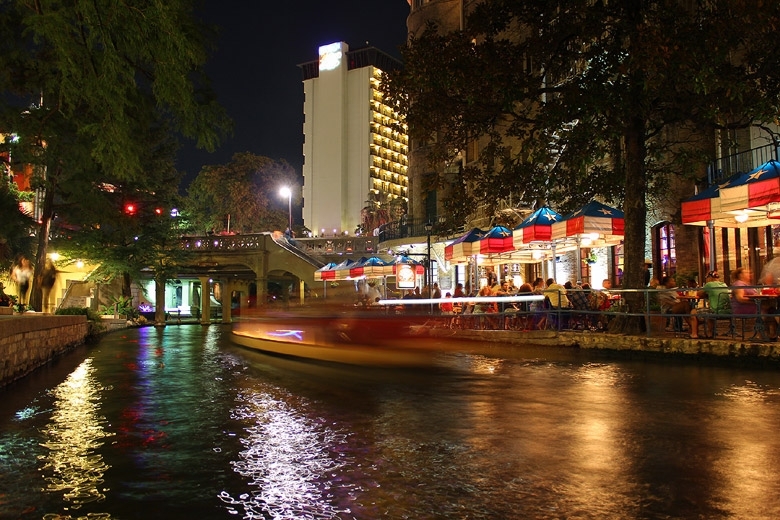 Really enjoyed a relaxing evening with some TPRers on the Riverwalk. As I recall, we did consider jumping this boat, but we were hungry at the time. 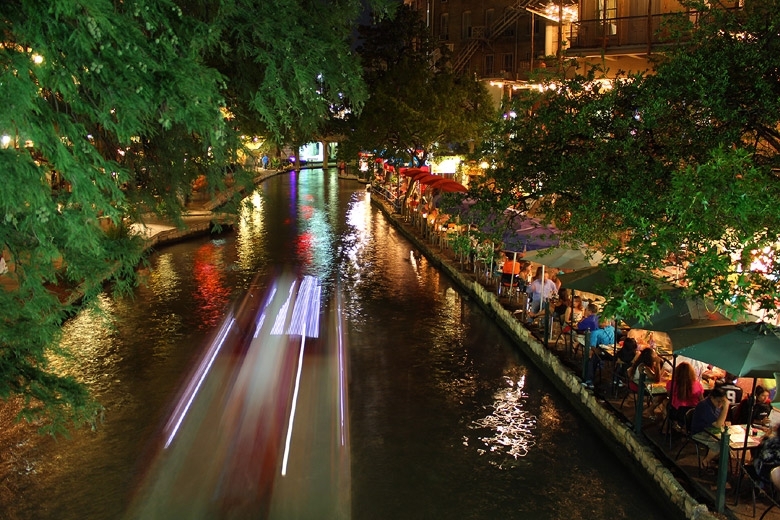 What happens at dusk in San Antonio? 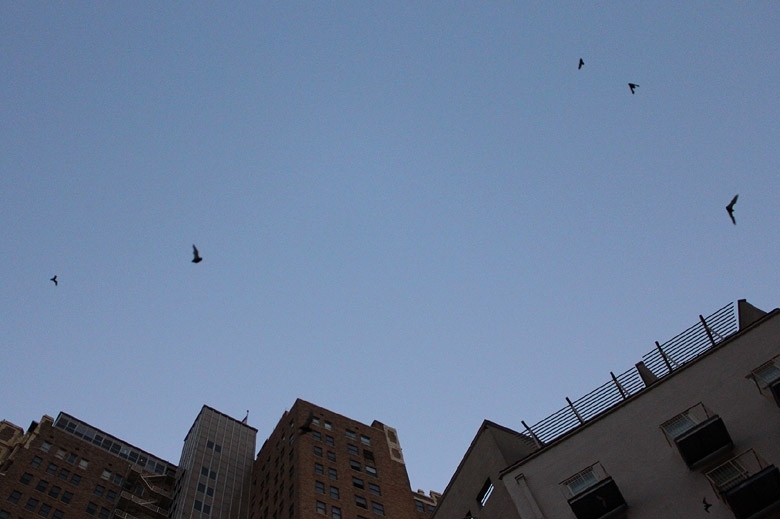 BATS! 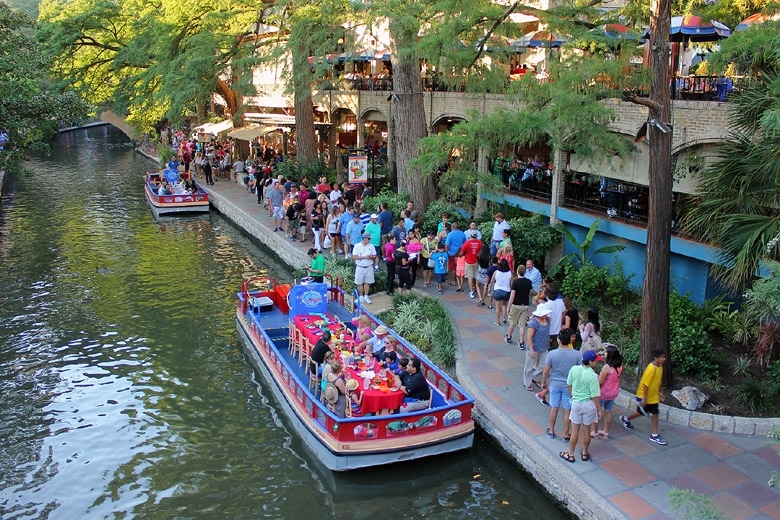 Riverwalk again -- lots of TPR people made their way down here, as it's pretty famous. 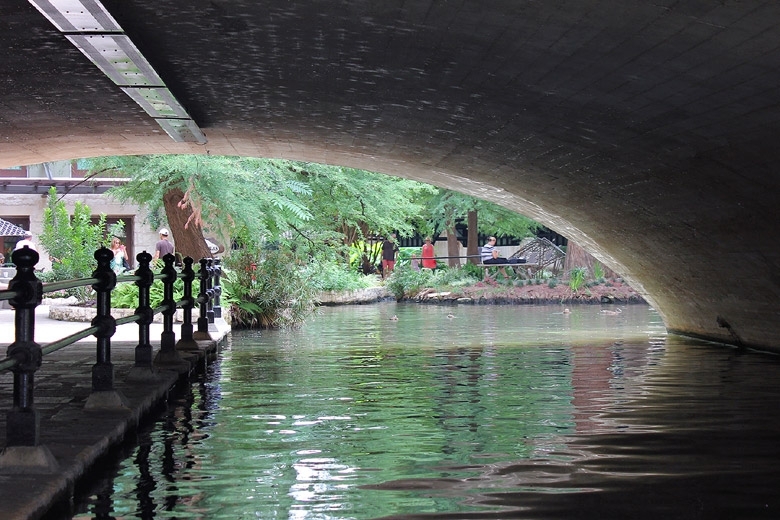 I found the end of the Riverwalk! 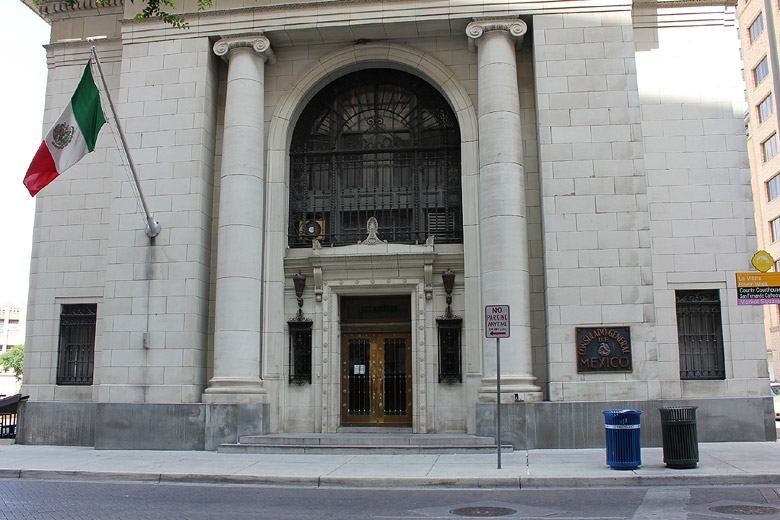 Mexican Consulate -- aka CULTURE CREDIT! 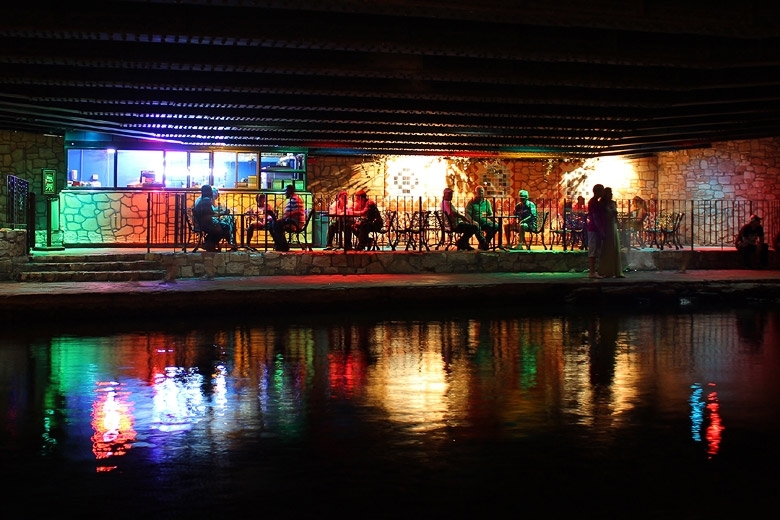 Yeah, San Antonio is a haven for photo ops. 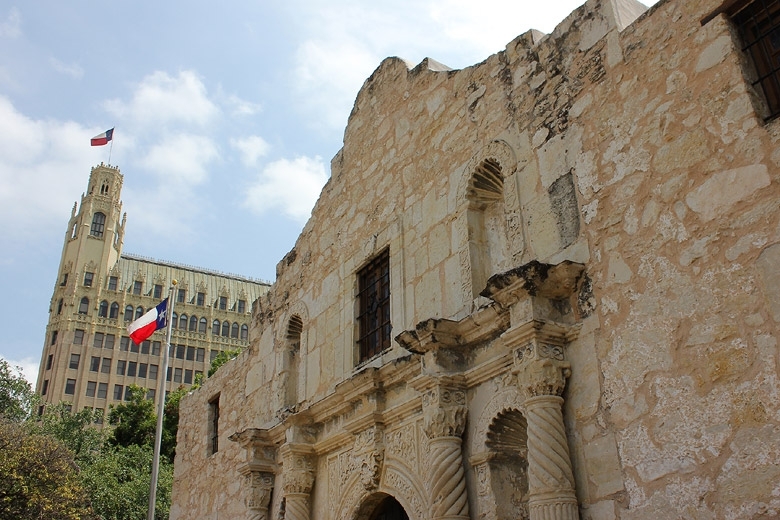 The Alamo -- an important history lesson we probably forgot by the second day of the trip. No photography in the building, unfortunately -- out of respect, I obliged. 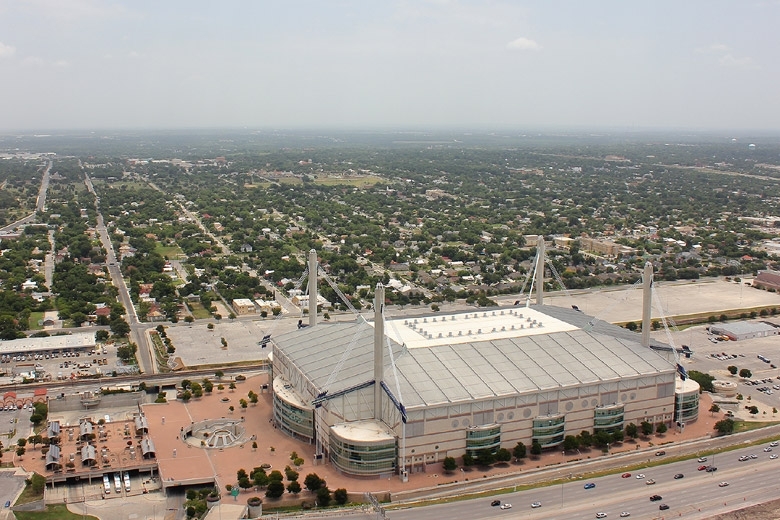 The Alamodome to the east. Last edited by The Great Zo on Fri Jan 24, 2014 9:00 pm. 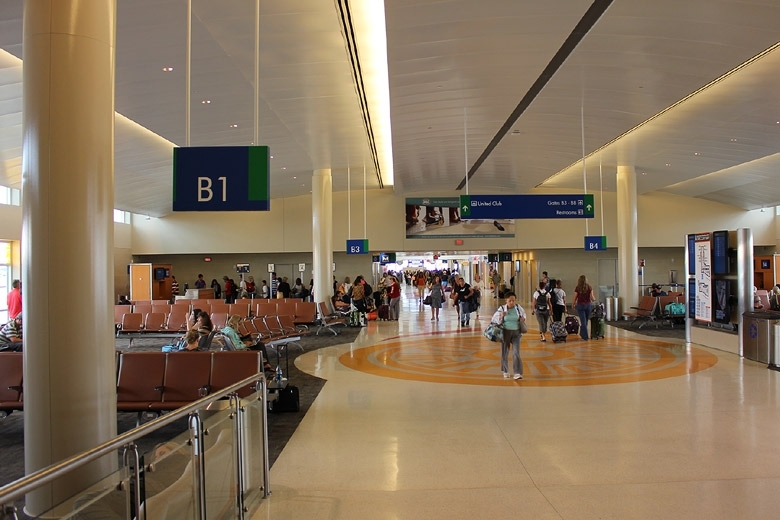 After parting ways with our Riverwalk group, I headed back to the airport to meet up with another great group of TPR arrivals -- Daniel, Matt, Andrew, Jay, and Alexis. 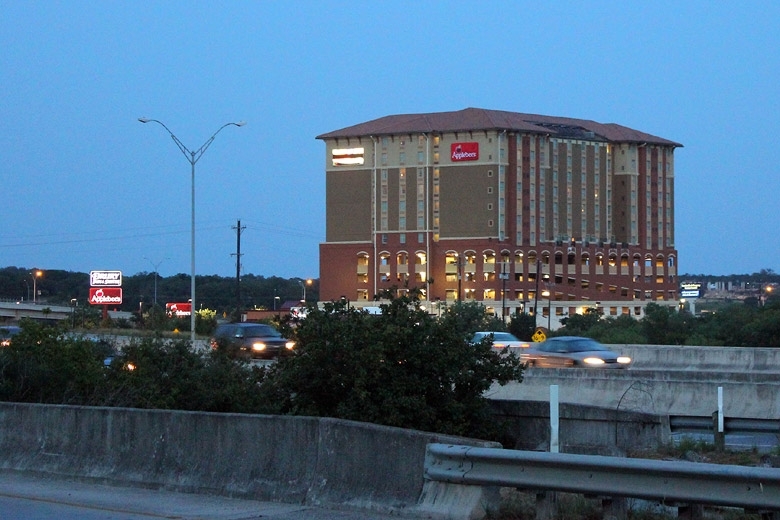 Buoyed by the generous honesty of a shuttle company employee (saving us a ton of money by suggesting a taxi), we headed to the official TPR hotel for the first few nights of the trip -- a Drury Inn within viewing distance of Six Flags Fiesta Texas. 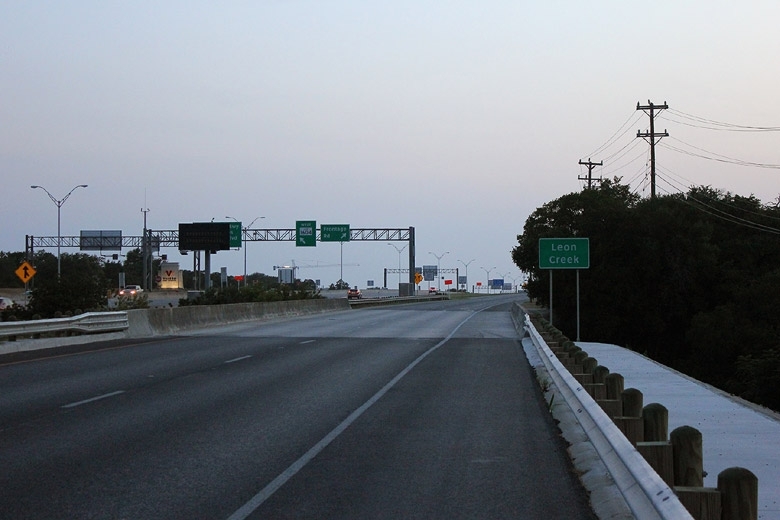 Somebody (sorry, it was me) had the brilliant idea to walk along a busy stretch of the Texas Route 1604 frontage road to go over to the La Cantera outdoor mall, in search of ice cream or something to do. 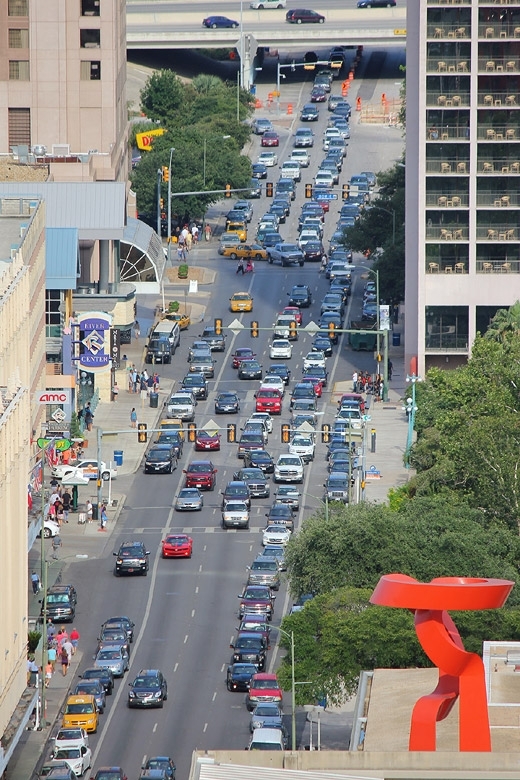 Simply crossing the street from the hotel to the chain restaurants was a challenge enough! 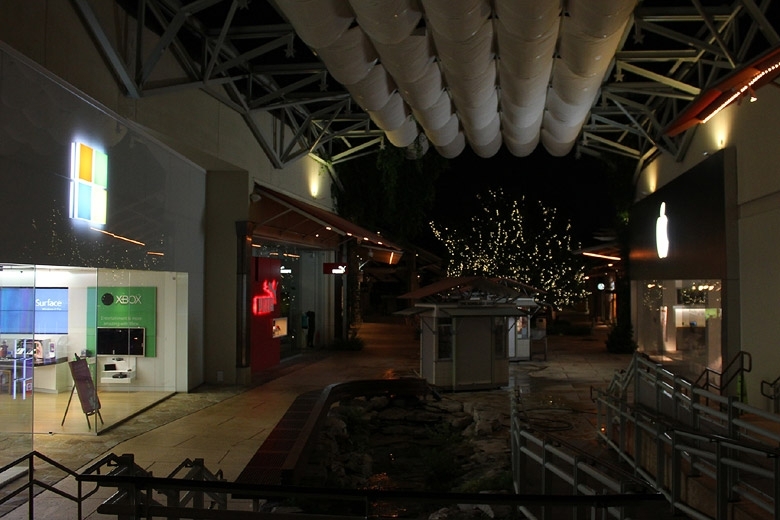 Despite it being just 9 PM, almost everything at La Cantera (except the playground) was closed. 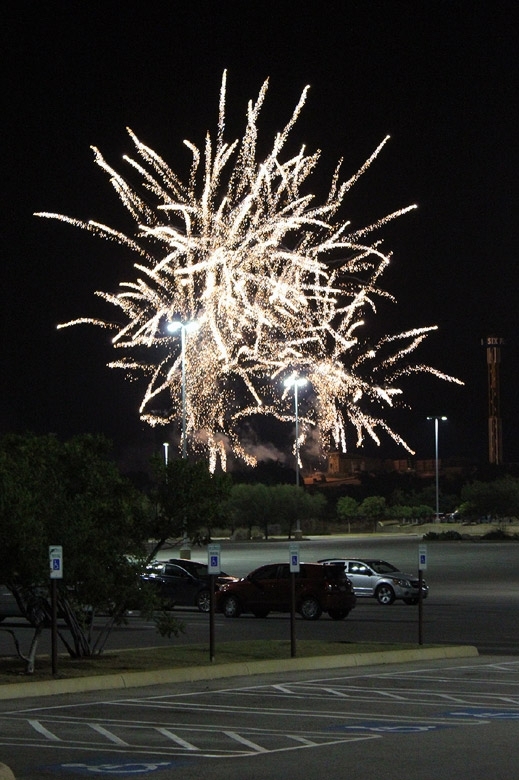 Thankfully, our efforts were not completely wasted, as we got a great view of the Lone Star Nights fireworks from SFFT -- a show we'd have front row seats for just two nights later. 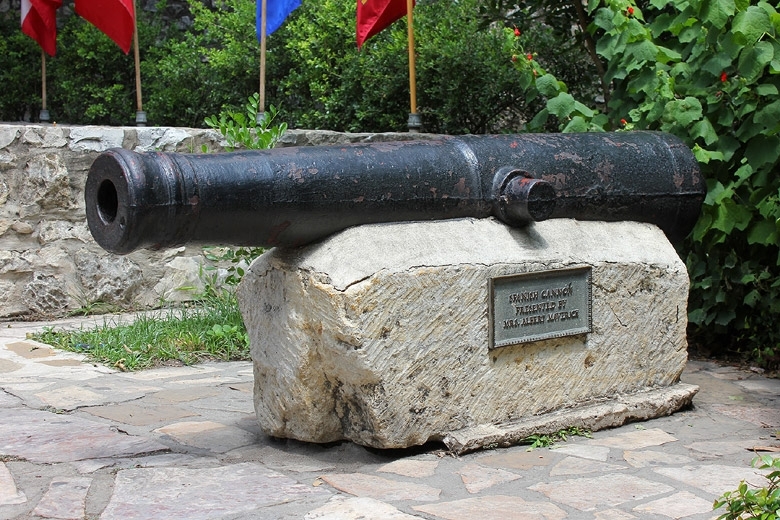 Six Flags Fiesta Texas, left side. 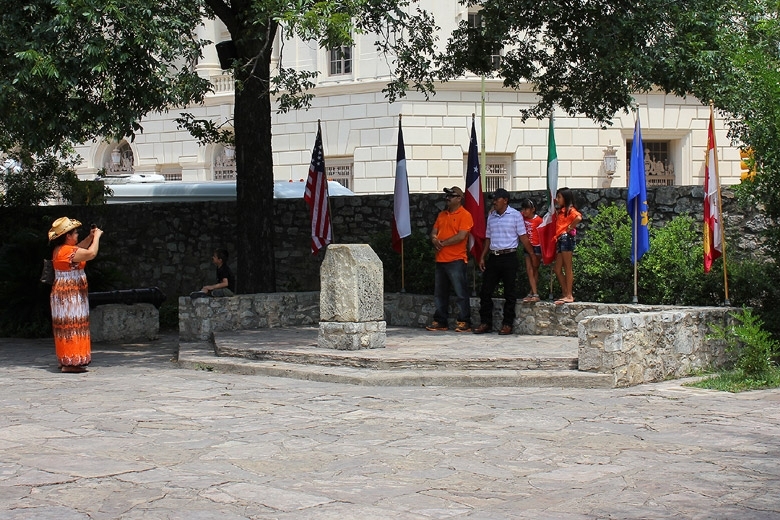 Six Flags Fiesta Texas, right side. Braving the walk across Leon Creek, trying not to get hit by cars, and discussing the finer points of our first days in Texas. 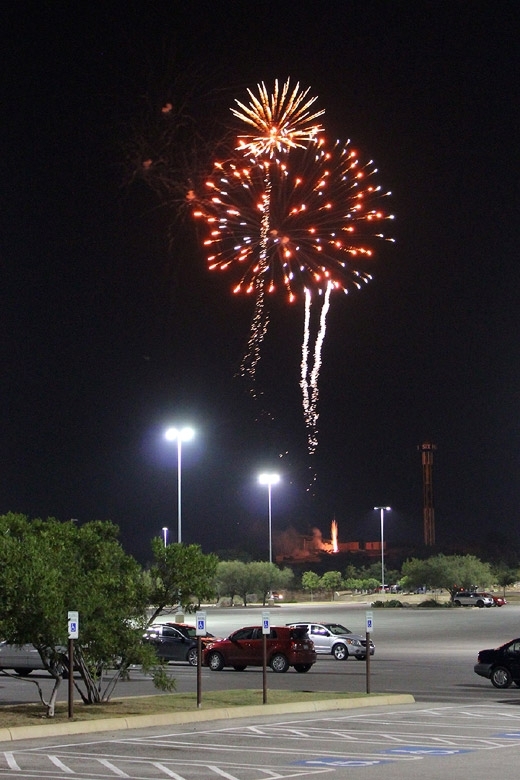 Our first taste of Lone Star Nights! 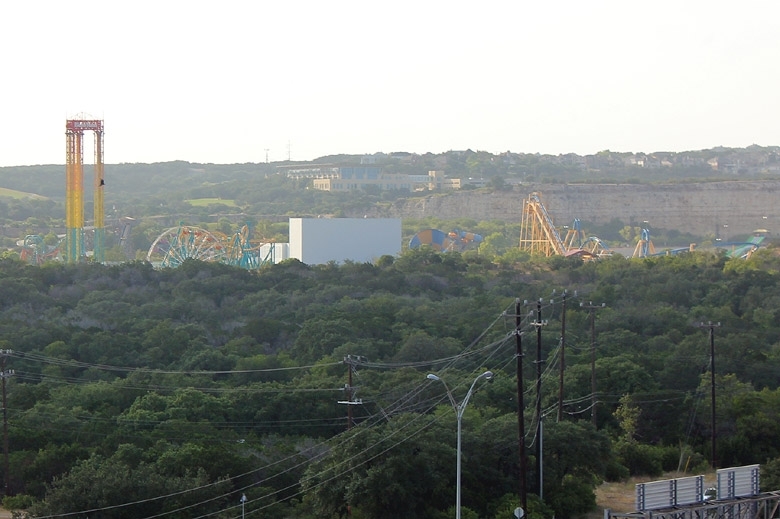 Up on top of the quarry walls, La Cantera is probably a solid 100 feet (if not higher) above the main "ground level" of the Six Flags park. 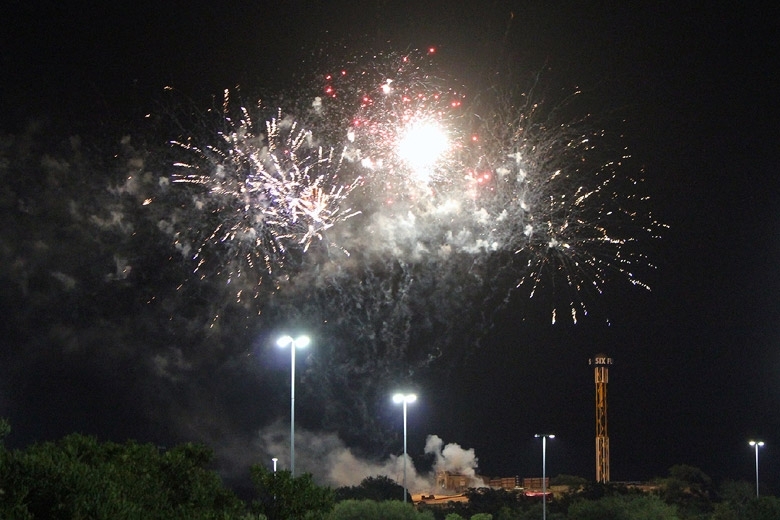 At least we got a free fireworks show out of our walk. Oh, Iron Rattler, why do you torture us? 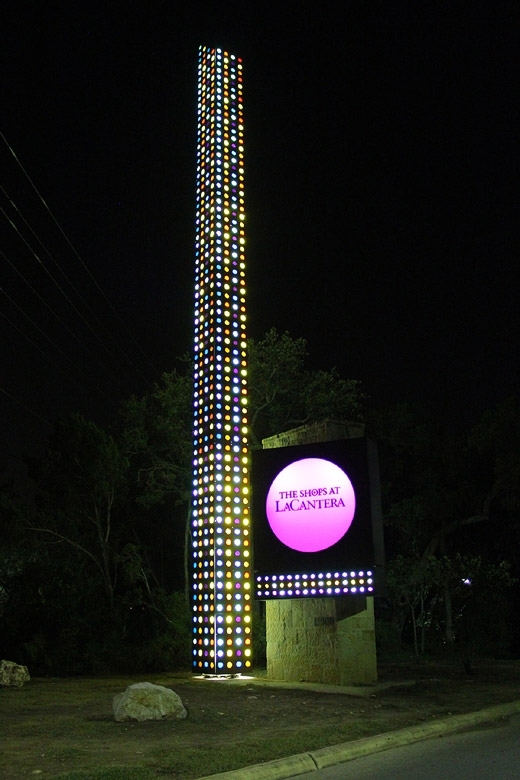 Leaving La Cantera for the night -- we'd be back the next day. 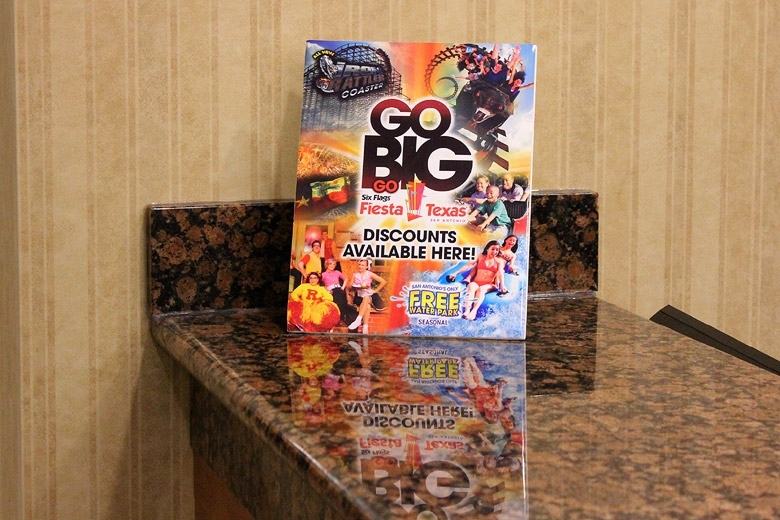 Of course, this was in the hotel lobby -- curse you iRat!!! Lesson of the Day: You're going to need proper footwear for the unshaded concrete at a water park. Ouch. Ouch. Ow, ow, ow, and ouch. My feet didn't completely heal from the burns for several days. 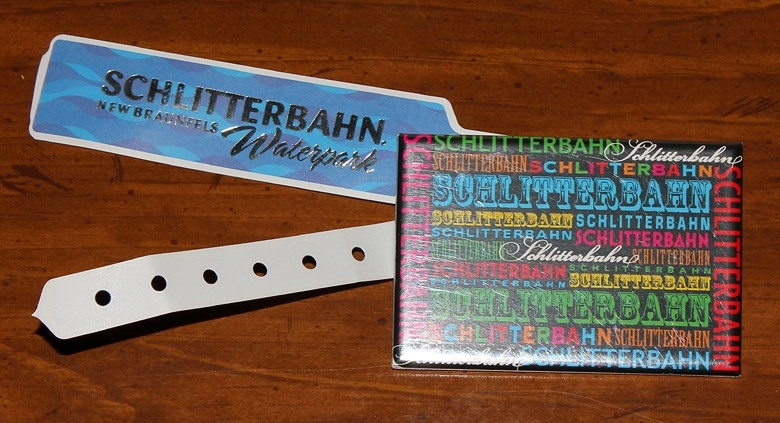 Our admission ticket to Schlitterbahn was this wristband, and the magnet (now proudly affixed to my fridge) was one of several gifts from the park. This photo album was another gift! Good news / bad news here. The good news is that this was far and away the most /practical/ gift I received -- I used this water bottle for the rest of the trip. The bad news is that I ran it through my dishwasher and it warped itself into this odd shape. 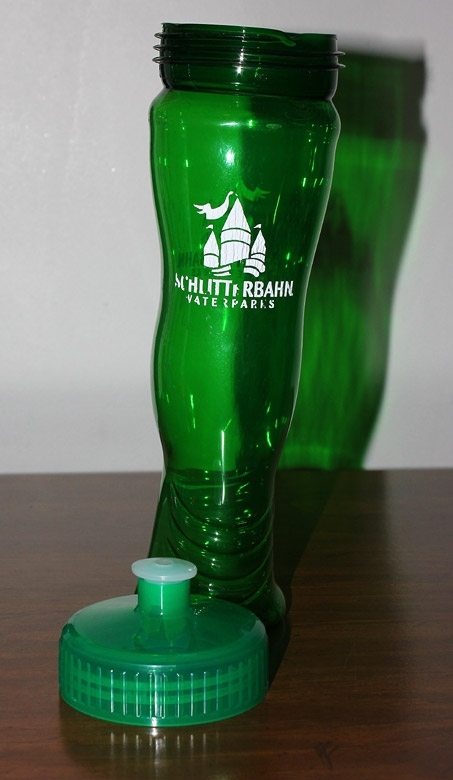 RIP, Schlitterbahn Water Bottle, you served me admirably in the hot Texas sun. This is from memory, as I couldn't really carry around a pen and notecard at a water park. We had about half of the TPR crew (one full bus load) in Texas a day early, hitting the road to Schlitterbahn for the pre-trip add-on day. 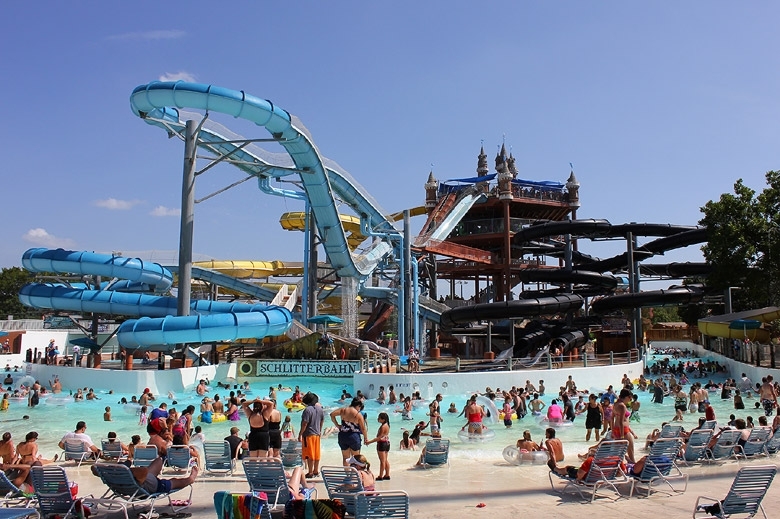 Schlitterbahn is one of those world-famous amusement destinations I knew I had to visit some day -- now, I know I have to visit again! 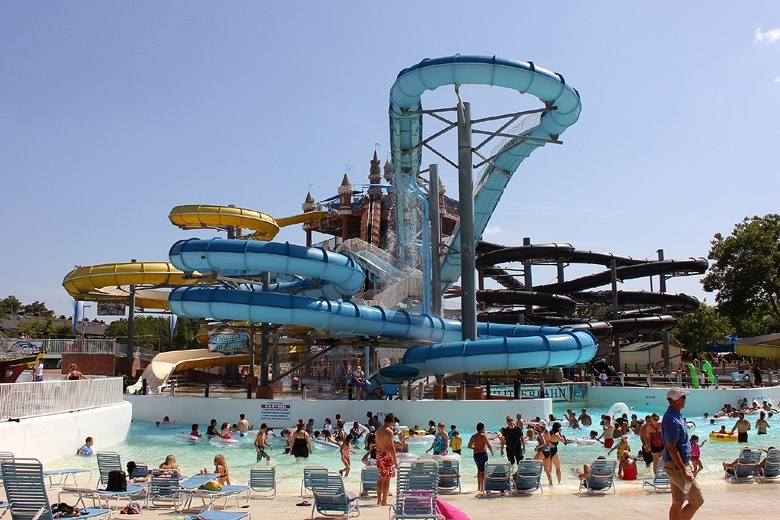 Schlitterbahn New Braunfels is actually two separate parcels connected by bus transportation, and each section has its own distinct feel and charm. 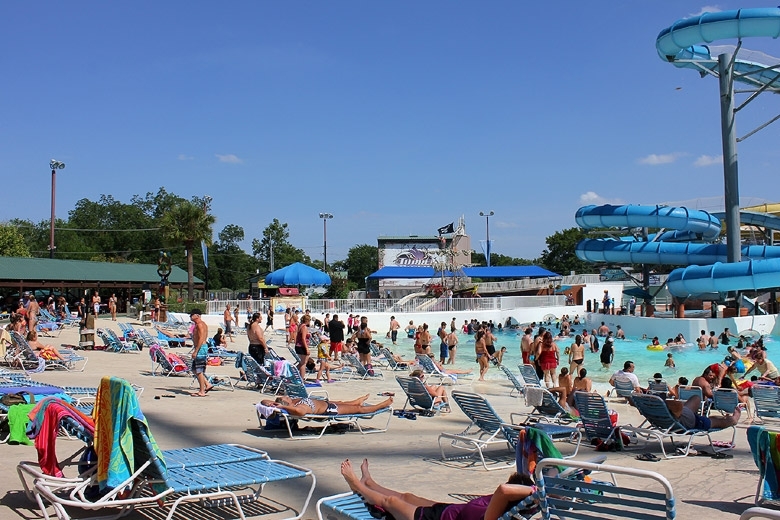 We began the day at the Blastenhoff section of Schlitterbahn East (the newer park), feasting on a nice breakfast spread (which I believe included pork tacos) before heading into the warm pool for our first TPR group shot of the trip. 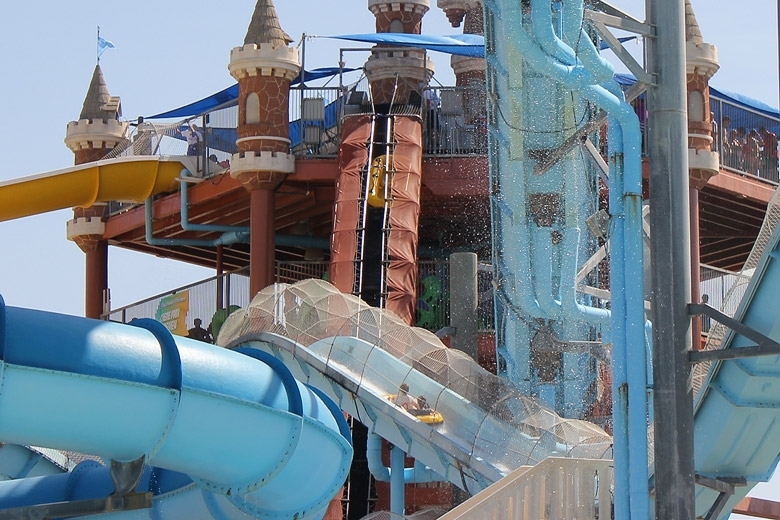 From there, it was time for ERT on Master Blaster, which has to be one of the most famous water rides on the planet. I had no idea just how important that ERT would be for us, but while in line for my second go, the resort guests began literally running to get in line for it! Our ten-minute ERT queue ballooned into what I would estimate was a two-hour wait, and it remained that busy for the rest of the day. I finished off the other slides in the Blastenhoff complex, and then we all made our way to be the first riders on The Falls / The Deluge, transporting us to the Surfenburg section of the park. There, we got the first rides of the day on Dragon's Revenge, before splitting up and heading to check out the rest of the park. 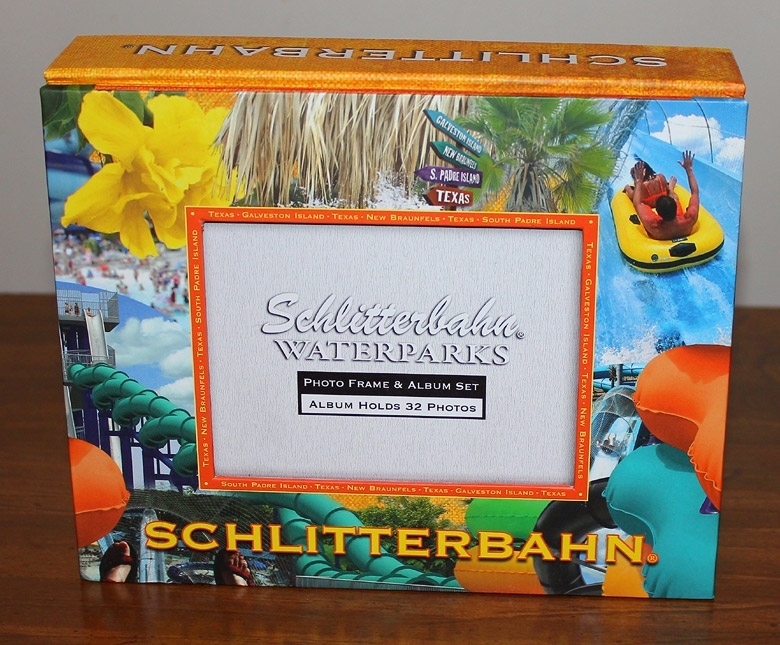 After seeing a little more of Surfenburg, I got on the bus to head to Schlitterbahn West (a.k.a. 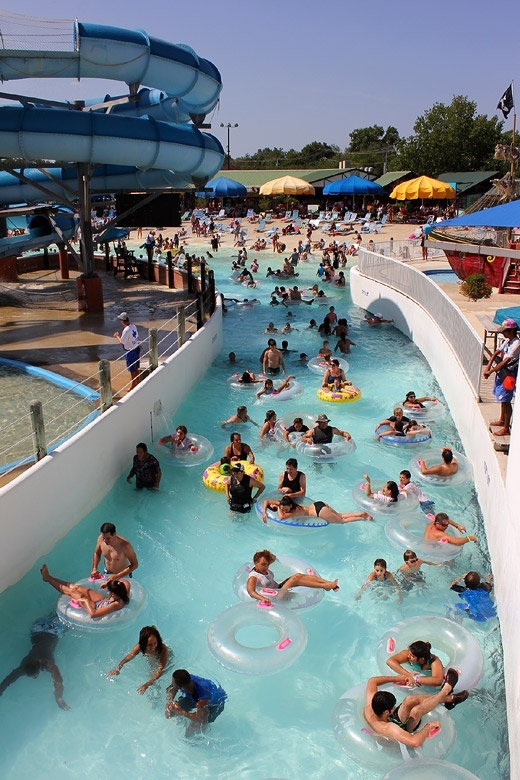 The Original Schlitterbahn). 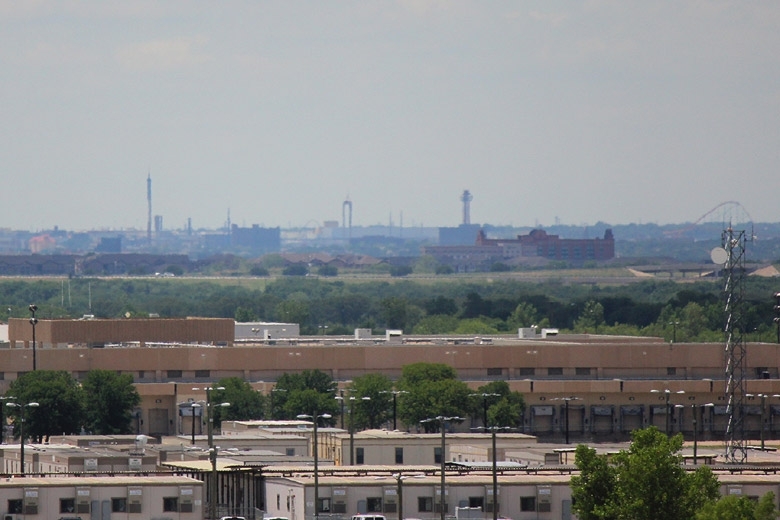 While Schlitterbahn East is a very modern-looking park in all respects, the other side of Schlitterbahn is almost completely different. 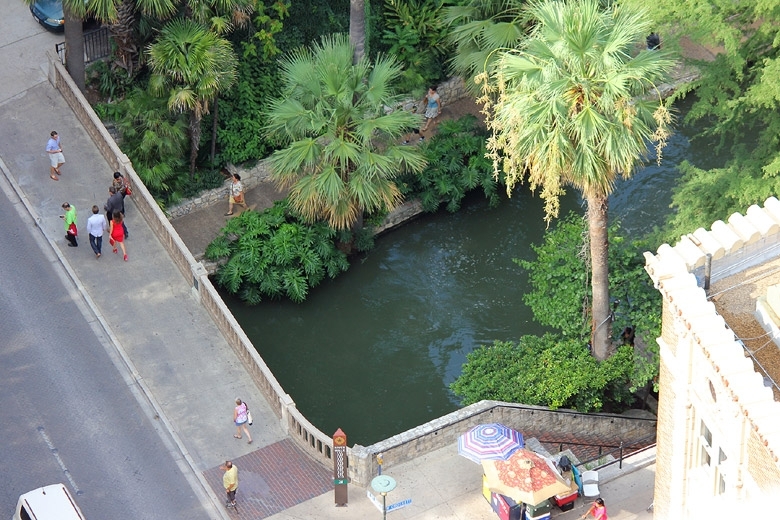 Situated on the steep banks of the tree-lined Comal River, this side of Schlitterbahn is known for its tube chutes -- seemingly-endless artificial rivers that flow across the hillside. 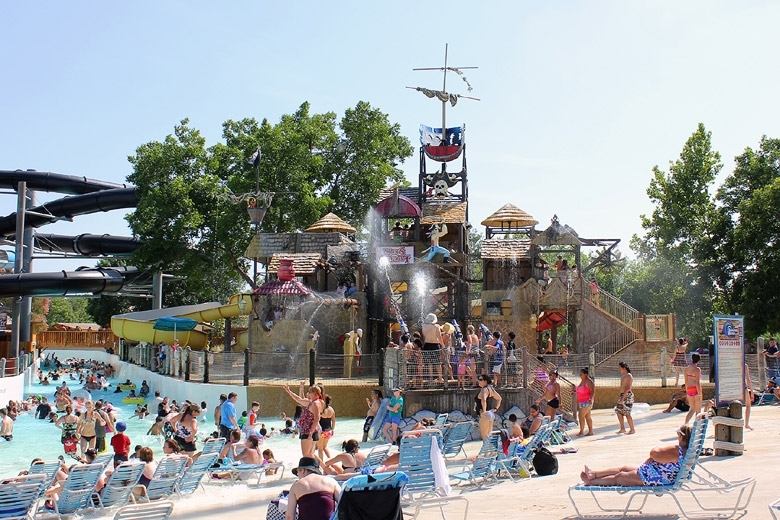 Unlike the heated and chlorinated water of Surfenburg and Blastenhoff, the original park draws its water directly from the river -- and because of that, it's darn cold! Not even temperatures of about 100 degrees could keep the chill away from a small guy like myself. 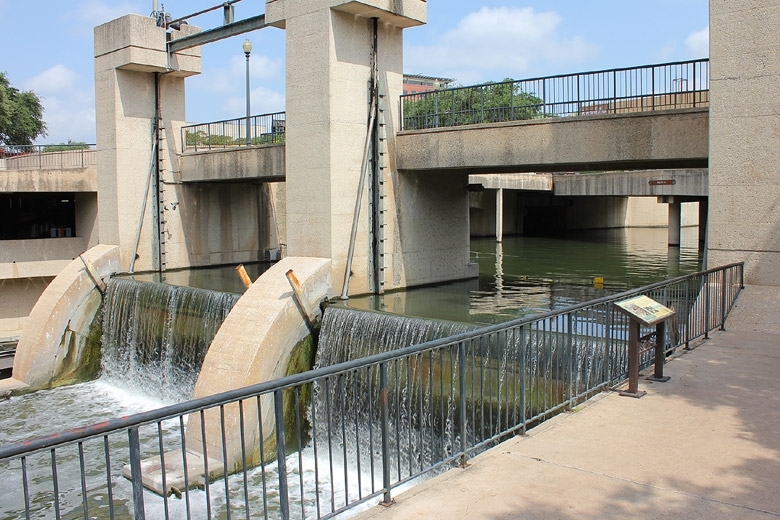 Some of the tube chutes do flow into the Comal, and though we were cautioned against dropping all the way down to the river, I kind of wish I'd have tried it. 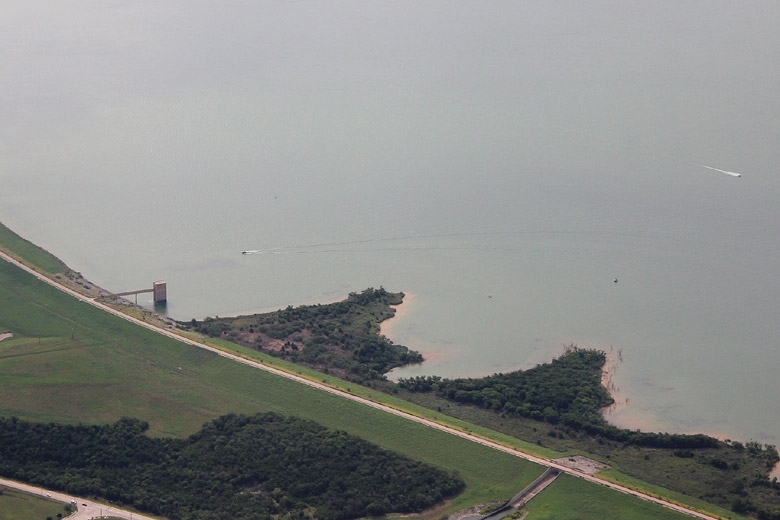 Of course, if you get carried away, you'll end up on a days-long journey rolling over a few dams, eventually floating over the Guadalupe River into the Gulf of Mexico's San Antoino Bay (which is nowhere near San Antonio). You might have caught back up to the group by the time they hit Cedar Point. After several enjoyable hours at the original park, I headed back to Surfenburg, taking the other side of The Falls / The Deluge back to our home base in Blastenhoff. We left the park at about 4 PM, but I would have loved the chance to stay there all day. 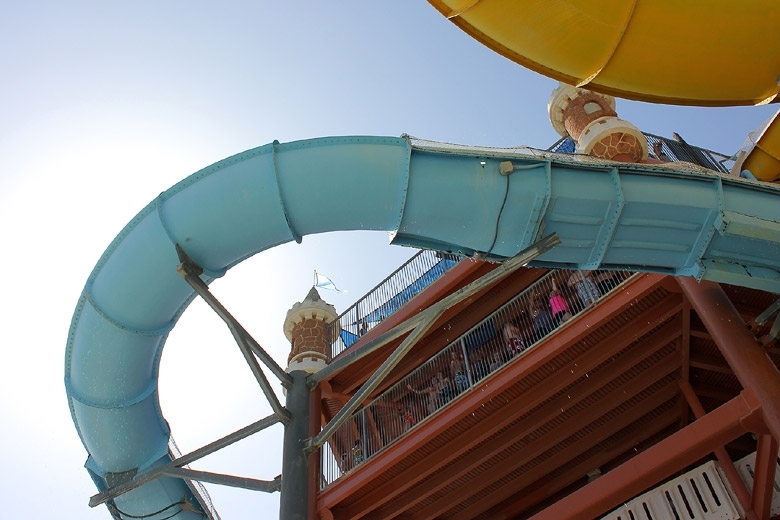 To ride every slide and chute in the park, it really would take a full day's effort. I missed a few of them, including the infamous Congo River Expedition that so many other TPR members spoke either fondly or infuriatingly about. The crowds were a little heavy, as could be expected on a hot day in the summer. This tended to lead to some backups on the tube chutes (including one collision in which I thought I'd given myself a concussion after snapping my head back onto the surface of the chute). Thankfully, I survived, marred only by a few patches of sunburn and a little bit of waterlogging. 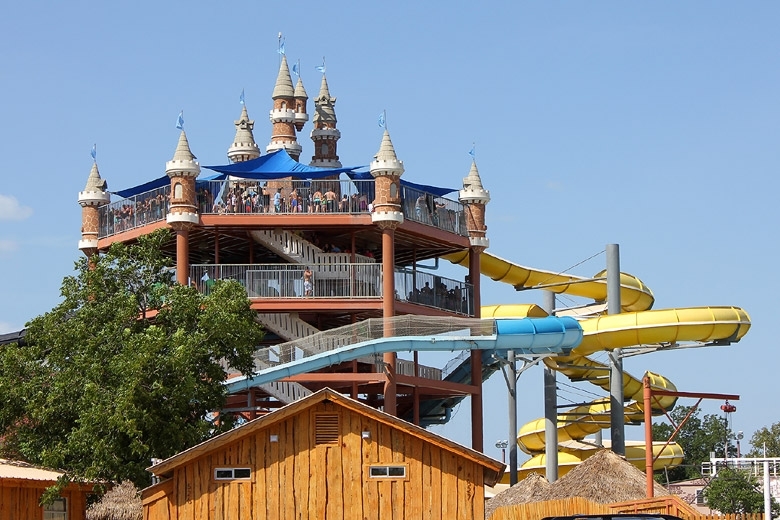 Overall, I can only give Schlitterbahn very high marks -- this is a unique water park with an incredibly wide array of things to do, and it's well worthy of its renown. 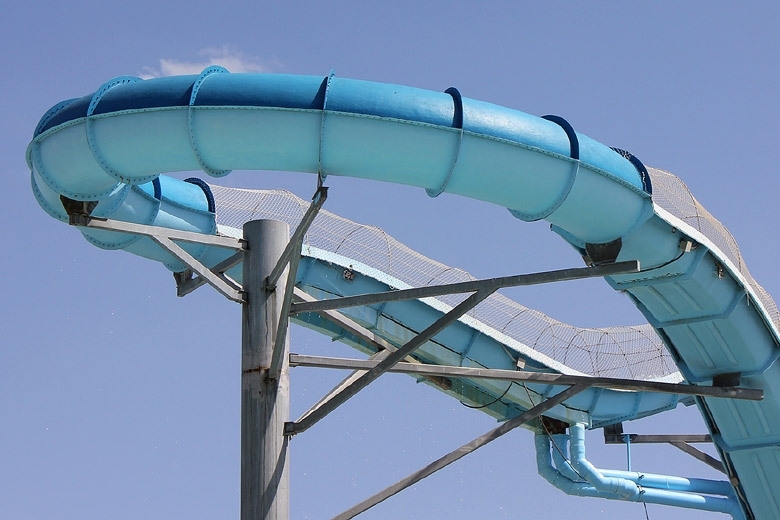 Master Blaster: This was my first water coaster, and I think it would be fair to say that most first-time TPR riders found it just slightly below expectations. Those expectations were probably impossible to live up to, given how famous the ride is. There isn't much airtime, but it's fun to jet around the elevated structure of the ride, powered by water and gravity the whole way. Dragon's Revenge: It's not as well-known as Master Blaster, but it's the park's other water coaster, and I actually enjoyed it a little more. The hills aren't as steep, but it's a longer and more consistent ride experience, with a few special effects along the way. 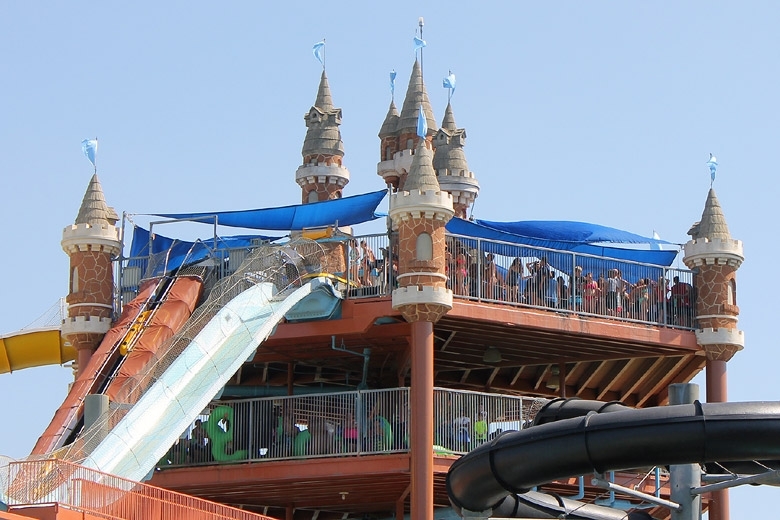 Boogie Bahn: Other reviews of Schlitterbahn's surfing simulator are spot on. This thing just behaves differently than the typical Flow Rider, as I'd come to find after receiving Flow Rider ERT on two occasions later in the trip. My two attempts on Boogie Bahn were abject failures, as I never could find my balance on this very difficult attraction. Backsplash: So simple, but so much fun! 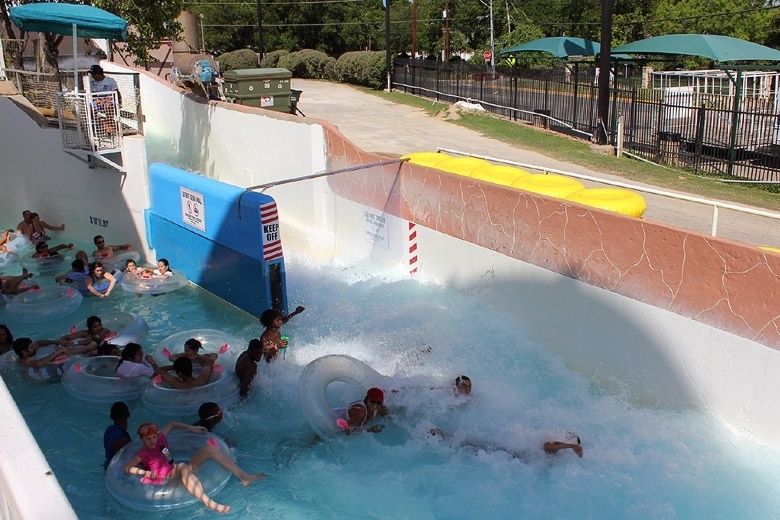 The water from Boogie Bahn is recycled into a swift-moving flow that empties into the Surfenburg lazy river. The entire surface is padded, with a current so strong that you're left with no option but to just tumble along as the water pushes you ahead. Downhill Racer: A typical three-drop mat slide, but it occupies one of the highest elevations of the original Schlitterbahn park. I caught some good air on the third drop. 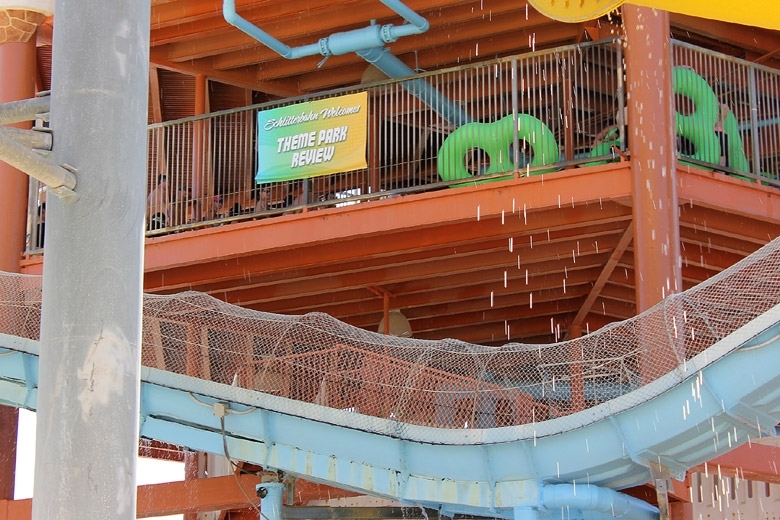 Raging River: As the longest tube chute at the original park, it probably took about a half hour to get through the entire thing. 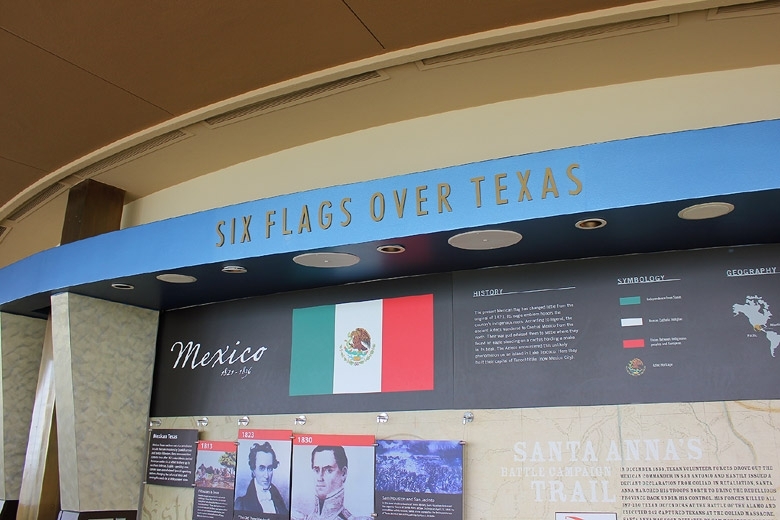 It winds its way ingenuously past the famous Schlitterbahn castle, between the tracks of the mat racer, under the main deck of the park entry building, and down the hillside past numerous other attractions. Like most of the other tube chutes, it's generally a relaxing flow, with a few drops and narrow sections along the way. The Falls / The Deluge: I have to admit that I'm not sure which segment of this ride matches with which name, but the end result of the experience is that it forms a complete loop between Blastenhoff and Surfenburg, with a giant AquaVeyer conveyer lift that gains the elevation necessary for the whole thing to work. In many ways, it felt like an expanded, modern-day version of the tube chutes -- several relaxing sections punctuated by rapids, drops, and turns. 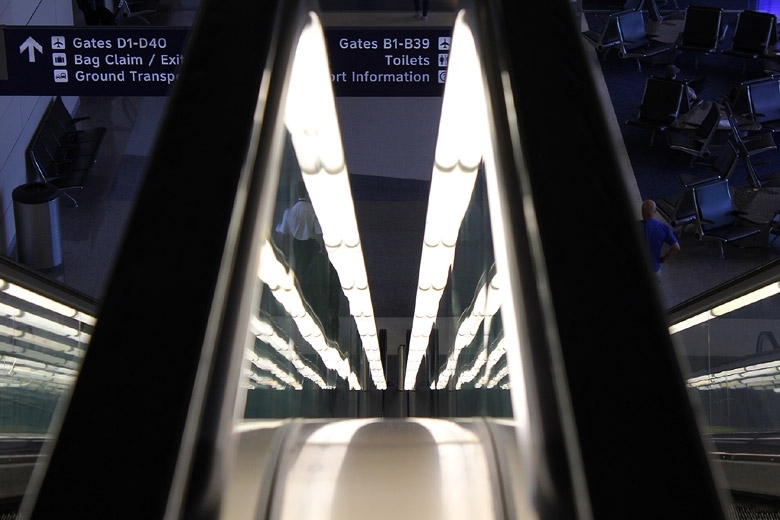 I can see how easy it would be to just ride this around for several cycles and lose track of time -- though you'd have to go on a less-busy day when they aren't turning people away from the conveyer lift! After returning to the hotel, the enormity of our full group began to gather, as we prepared for the official welcome dinner. My attempts to meet the other trip participants incrementally had been mostly successful, even up through our day at Schlitterbahn. 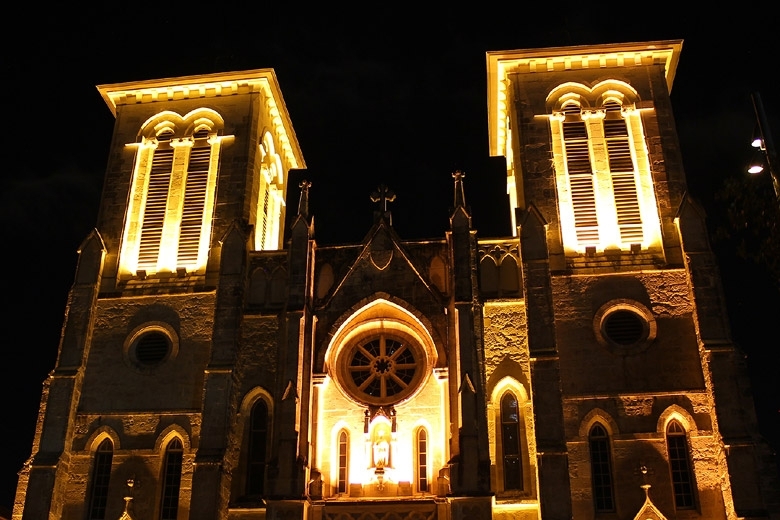 However, as a group of 40 suddenly became a group of 90, it was obvious that it couldn't be done in one night! We loaded up in our two buses and headed over to Grimaldi's Pizzeria in La Cantera. That was the trip's best pizza, without question! We received our welcome packages and got to know each other a little better, as we prepared for the first official day of the trip. By the end of Day Zero, I had already met people from the US, Canada, China, Australia, New Zealand, France, the UK, and Germany -- at least eight of the ten nations (add on Belgium and The Netherlands) represented on the trip! 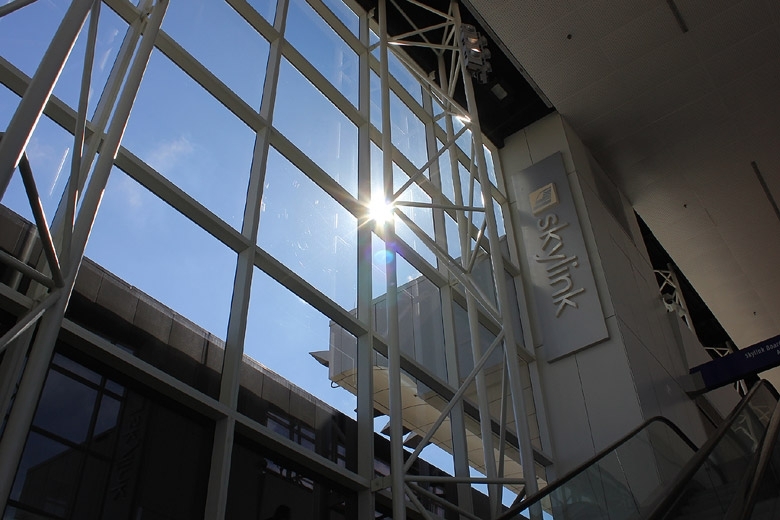 Day 1 had not even started, but I felt easily at home with this large and friendly group of amusement enthusiasts. 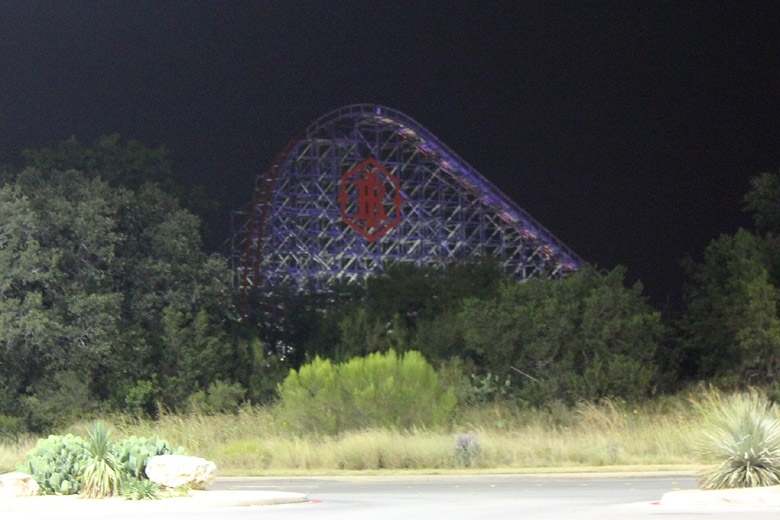 My photo set from Schlitterbahn is very limited, since I really only had time to take some pictures of the Blastenhoff area at the beginning and end of the day. The official TPR thread has a bunch of good pictures, as does the trip report posted by Marcel here. The main beach area at Blastenhoff. The first big curve on Master Blaster. After rides on Master Blaster (twice), Black Knight, and Wolfpack, this is what the tower looked like. Absolutely packed with people the whole way up. Lounging by the beach. 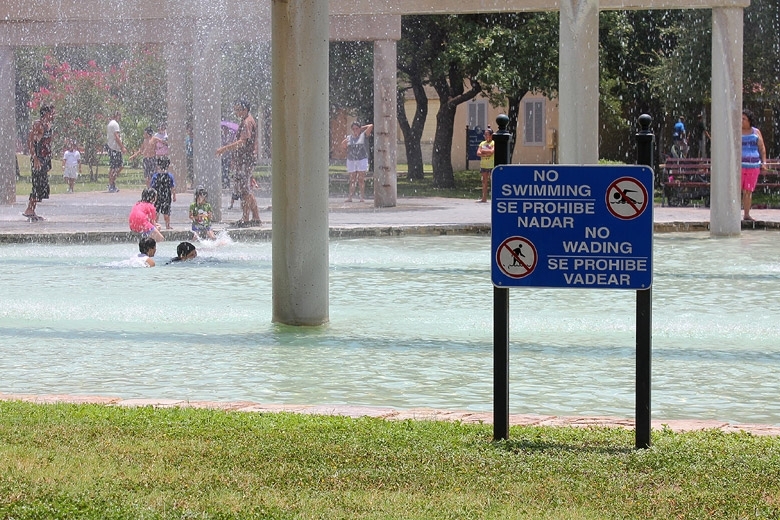 No time for that on a TPR trip -- too much of Schlitterbahn left to see! A play area in Blastenhoff. This wave pool is connected to the Torrent River, which runs around the island that contains the big tower in the middle. Rocketing up one of the hills on Master Blaster. Floating down the Torrent River in the rather extreme Texas sun. A TPR banner hanging at the top of the Blastenhoff tower! The giant water release point for the Torrent river -- sending out waves several feet high that really fly around the trench. 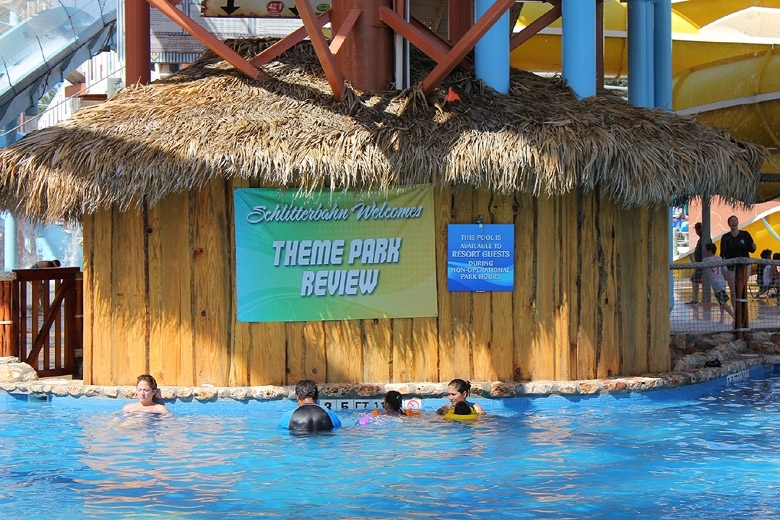 In all, I heard that there were six TPR banners hung by the Schlitterbahn staff. They really made us feel welcome, with the ERT, gifts, and banners! 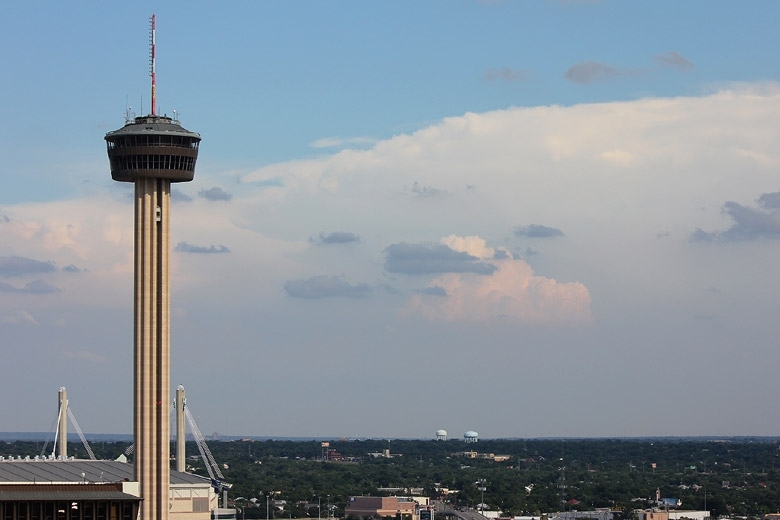 A final look at the Blastenhoff tower as we headed back to San Antonio for our first dinner with the whole group. Last edited by The Great Zo on Fri Jan 24, 2014 9:01 pm. Amazing report so far! Can't wait to see more! Great report Andy! Can't wait to read more! By the way, my sport bottle is suffering from the same issue with the logo coming off. Good start to the report! And very nice photos! Can't wait to see more! Awesome report! I cant wait for the rest!